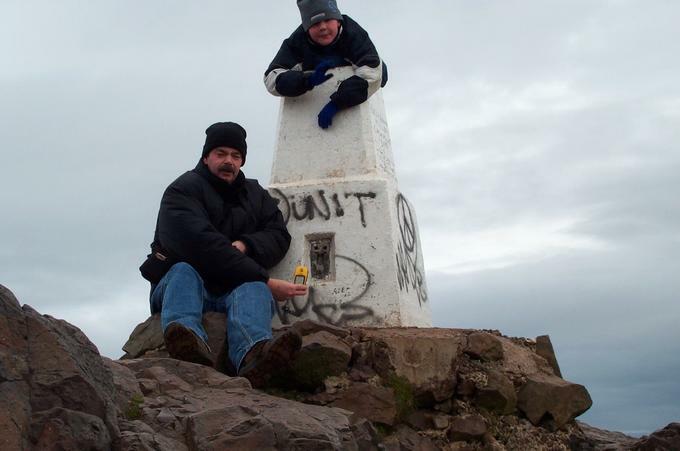 There are 162 photos for this trigpoint (view album). 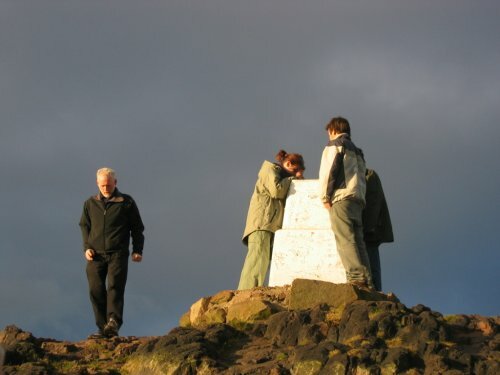 Is ranked joint 312th with 7 other trigs (more). See 153 more in the album. Lovely place for an early morning walk. Rather nice little design, find a quieter route at the side of the hill to go up. We're slithering with our boots on - bit of snow and a brisk easterly - wonder how many people do damage to themselves going up in trainers etc? 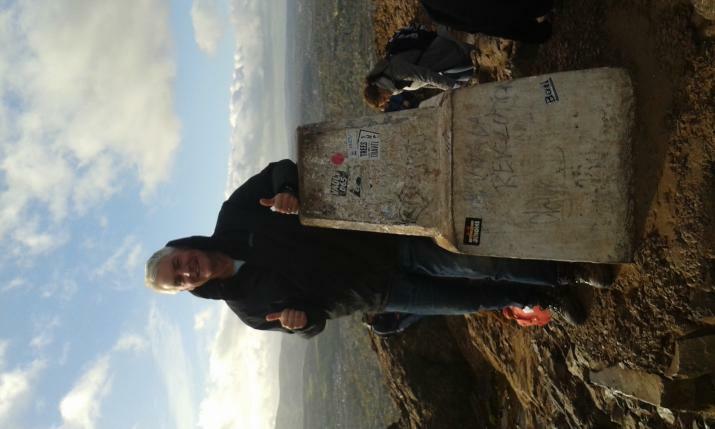 Busy but manage to get to the top. 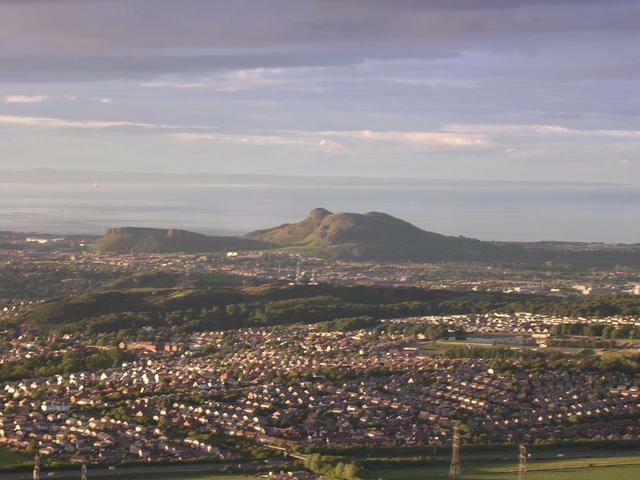 View out to the Lammermuirs (a treat from the Autumn) out to the Lomonds and Ochils (on the list), Pentlands slumber, Western hills still a bit clouded but to the east Isle of May, Fife and Bass Rock look splendid. 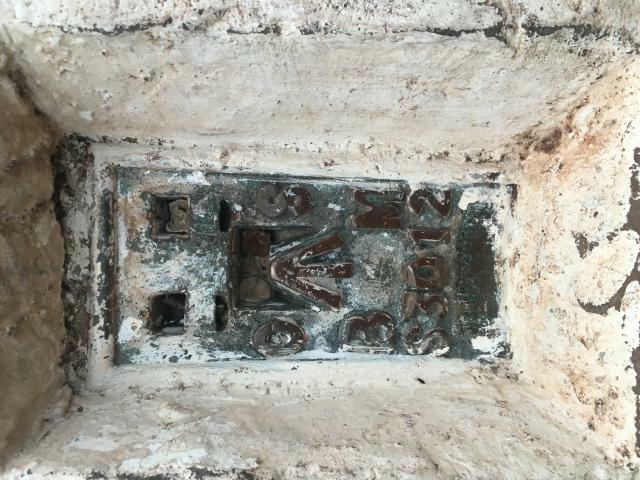 On to do the bolt and locked away trig to complete the trigging for this visit. 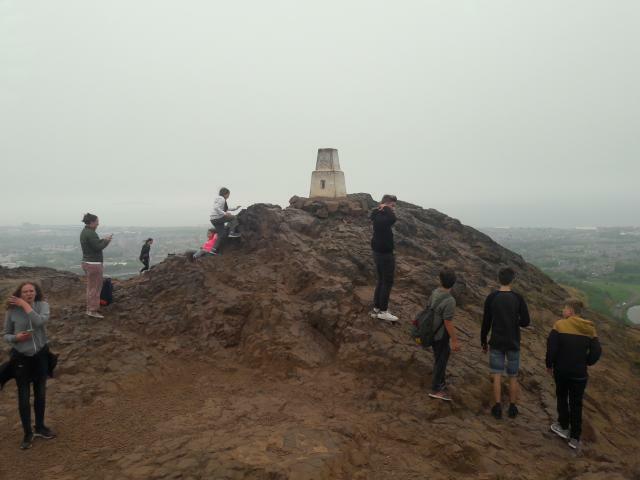 Top of an extinct volcano, whoooh hooo one of Edinburghs landmarks,busy with visitors. 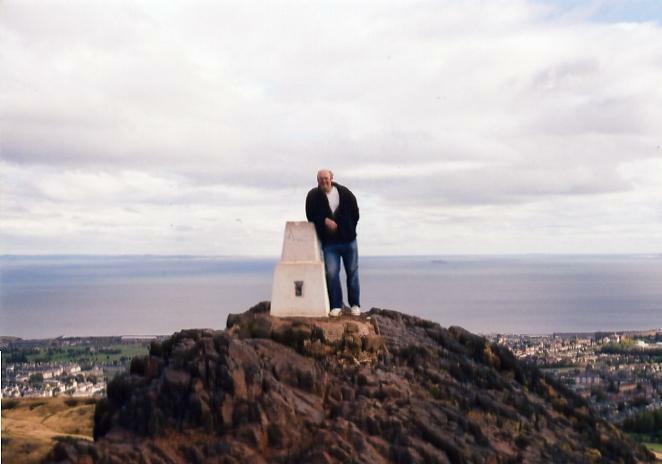 Arthurs Seat. Amazing views all round. 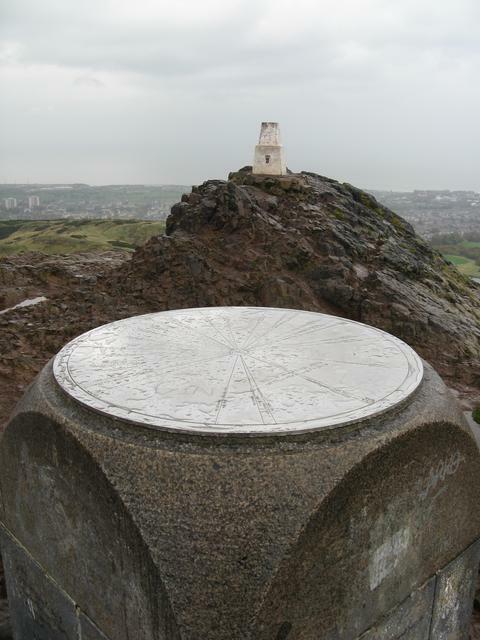 Pre work run up Arthurs seat and Calton Hill. 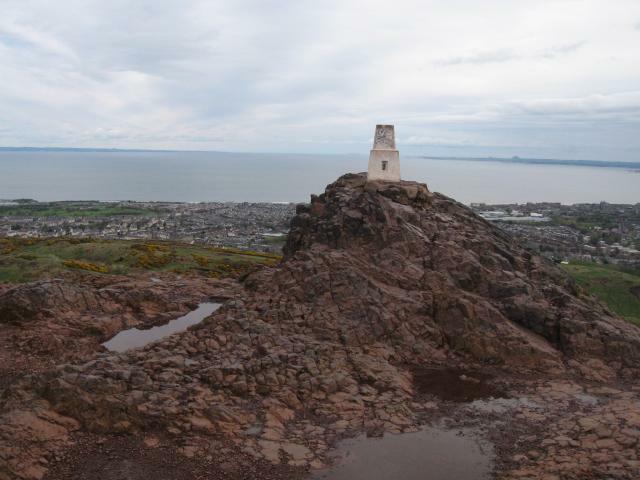 Surprisingly busy at top of Arthurs seat, couldn't get picture of pillar, low light and too many people. 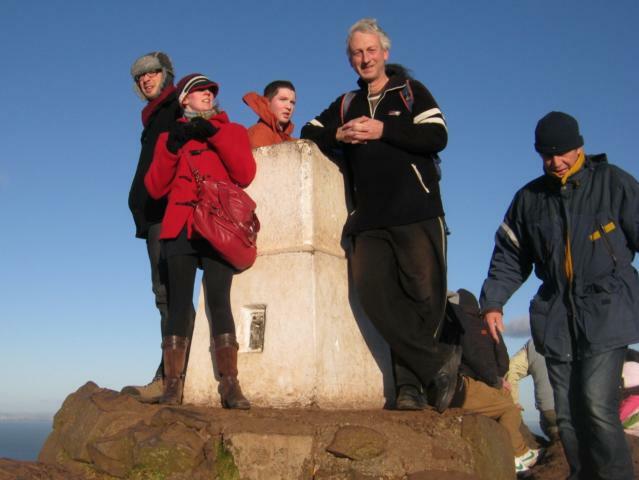 Lovely walk up and in a clear day like today fantastic views. Main drawback is that with a relatively short climb there are lots of people. 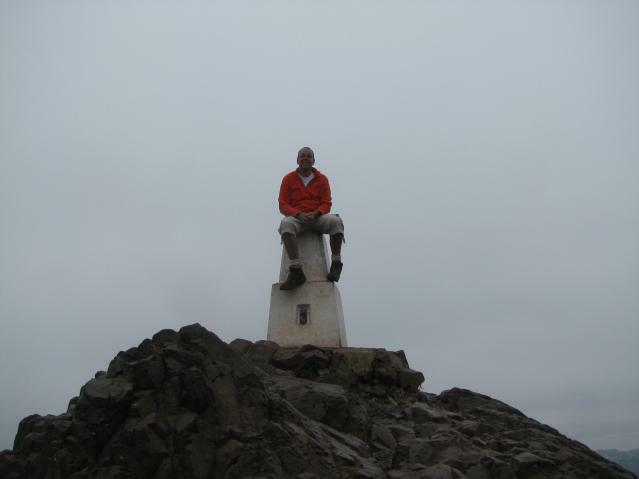 Can't remember visiting such a popular trig point - Snowdon may be. 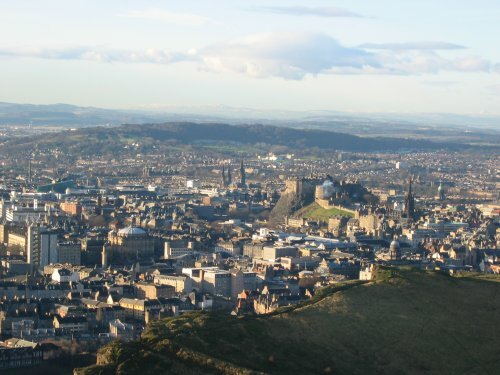 Visiting Edinburgh as part of my challenge to have a pint of Guinness in every European Capital City. This was number 50 out of 52. Came up a fairly steep way from the west. Went down a more gentle way. Fantastic views on a grey first day in the city. Great to get out bearings. 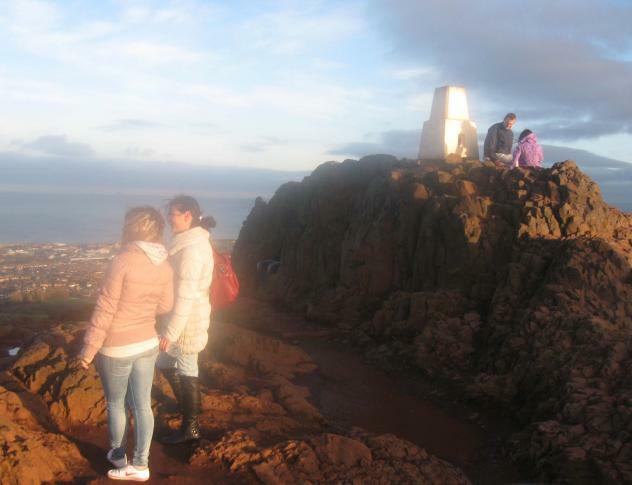 So busy at the trig though! 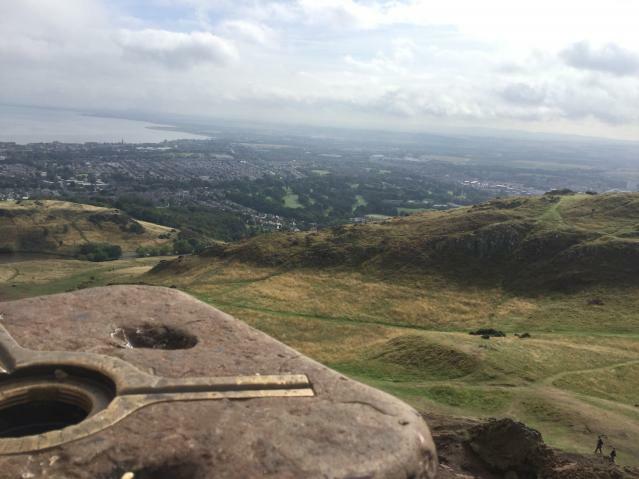 Simply fantastic views, but quite a jaunt to get up and down. My 3rd visit. 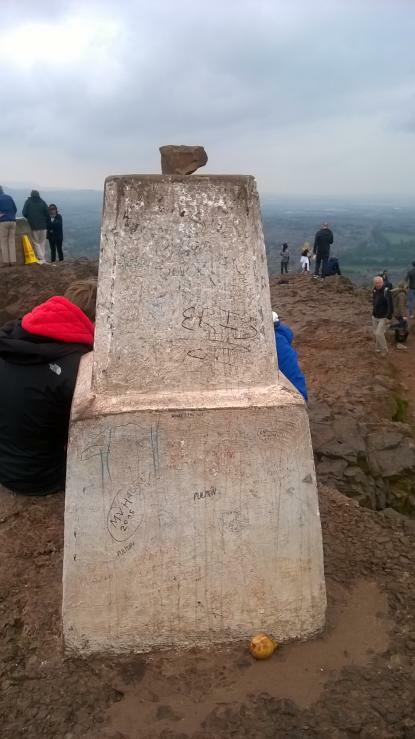 The usual crowds at the summit. 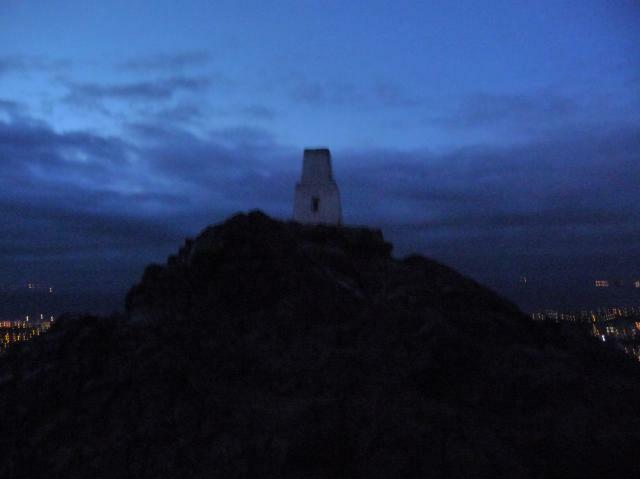 Up on the summit pre-dawn to watch the sun coming up - fantastic! Fantastic views from here. Very busy today. Rocks approaching summit shiny slippery due to footfall traffic. 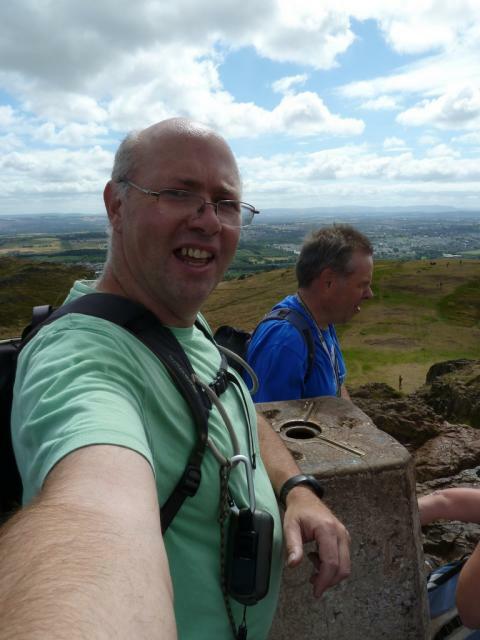 Walked up from Dunsapie Loch with P61 & Brunshaw,a busy summit today with fantastic views. 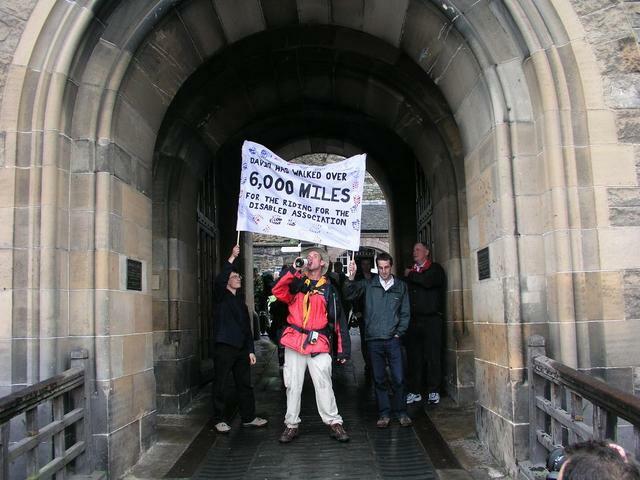 Did on day trip to edinburgh. 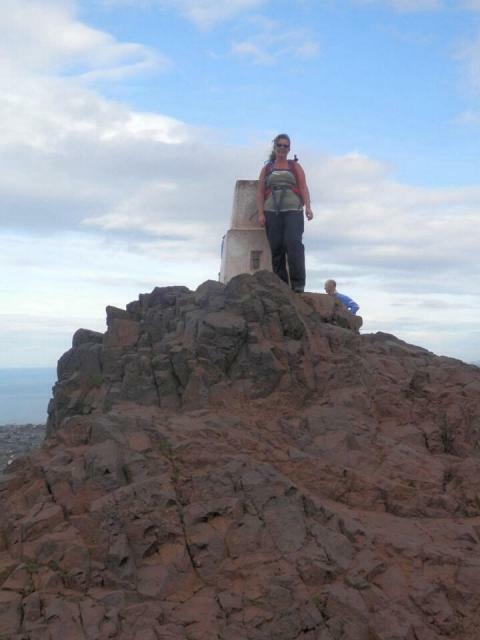 Fantastic summit with great views. 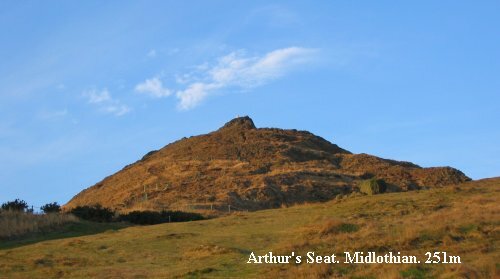 Easy parking up from layby next to lock steep pull to top,trig is perched on volcanic rock which is well polished with the many thousands of visitors.Trig has been repaired with a new base incorporating the fb.Top packed out with people why not what a viewpoint it is give it 20 if i could! not alone up here today. Grear revisit after viewing Edinburgh FBM and Dunsapie Tank. Flipping breezy. Busy like an anthill, except not so organised. Steep scramble up last few yards. Worth it though. 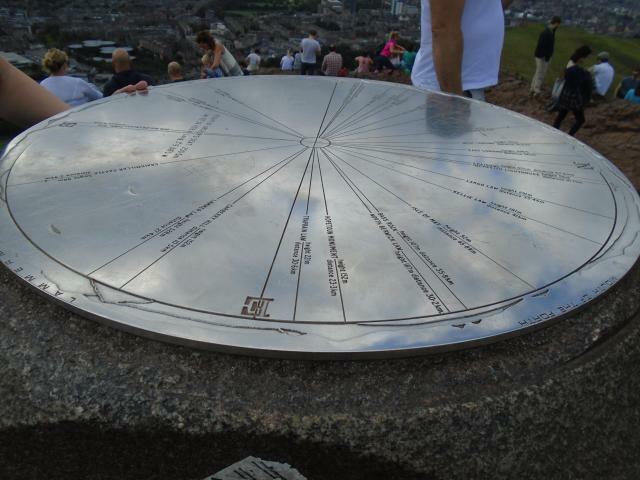 Visited the summit after a morning at Edinburgh castle. 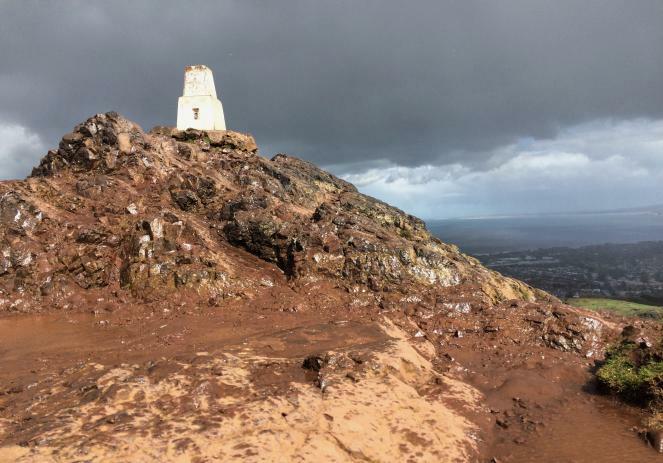 Challenging weather conditions - heavy rain shower on the way up and hail plus howling gale at the summit. 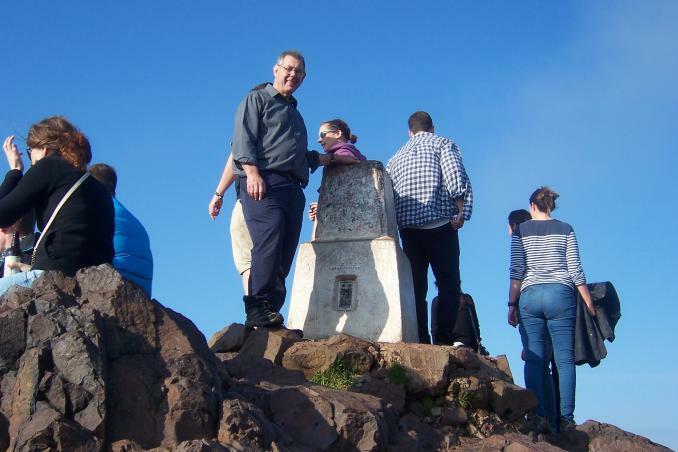 Had to wait in a queue to scramble up to the trig - as I was rather tentative at the prospect, several rude people jumped the queue! We were rewarded for our efforts with sunshine and stunning views on the way down. 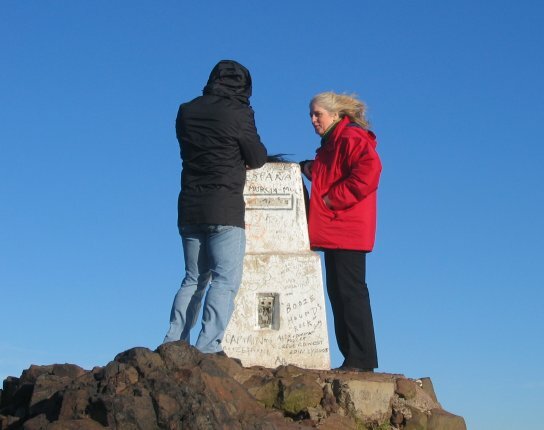 Too windy to stand up at the trig! 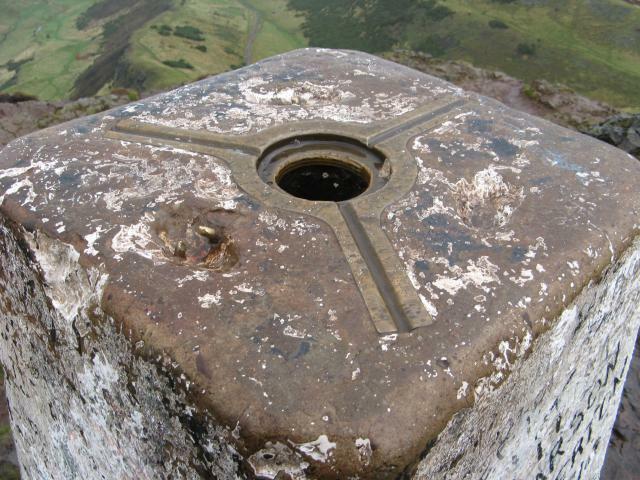 Well visited trig and showing the wear and tear from multiple visits. 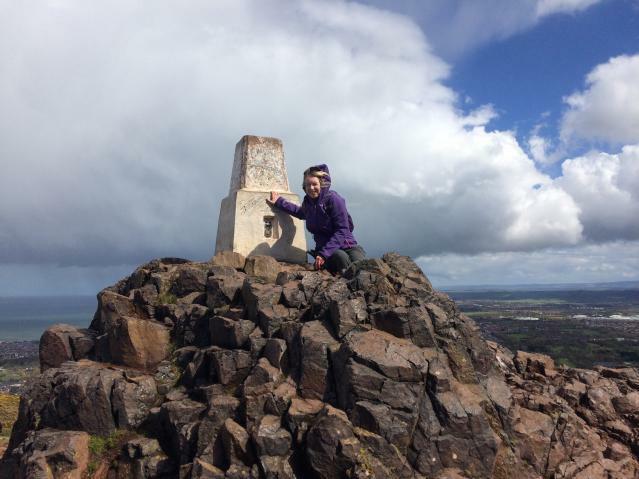 Good views to Fife, Berwick and surrounding areas however spoilt by the numbers at summit. Too busy for me. 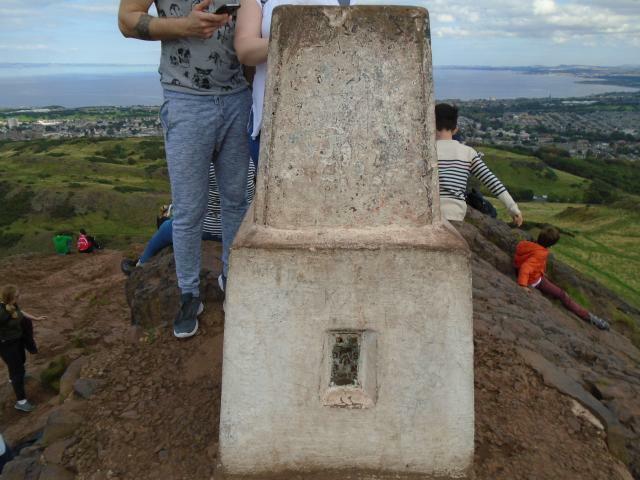 Had to wait my turn to get near trig, young couple sat on it for ages. 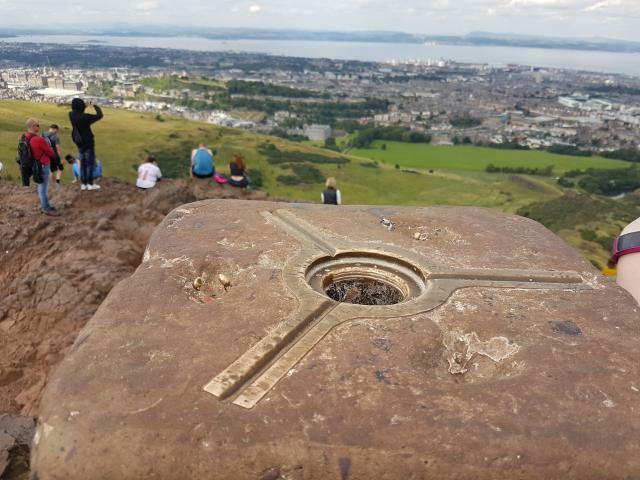 Popular spot, great views. 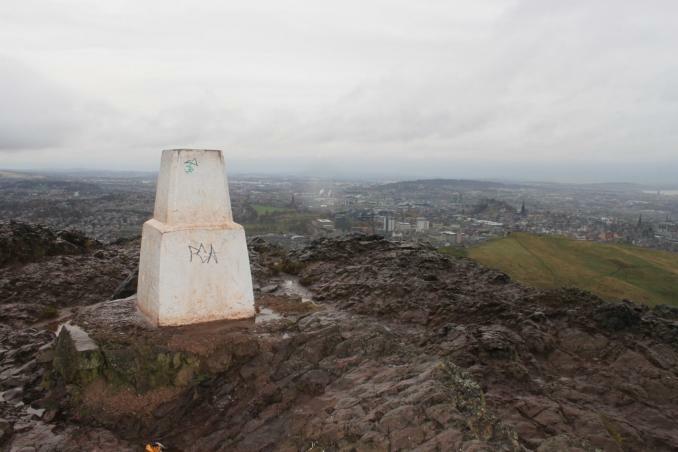 Excellent all round uninterrupted views, easily accessible for central Edinburgh, Gets a 10 from me. Damage is very slight: I've opted for 'good' condition. 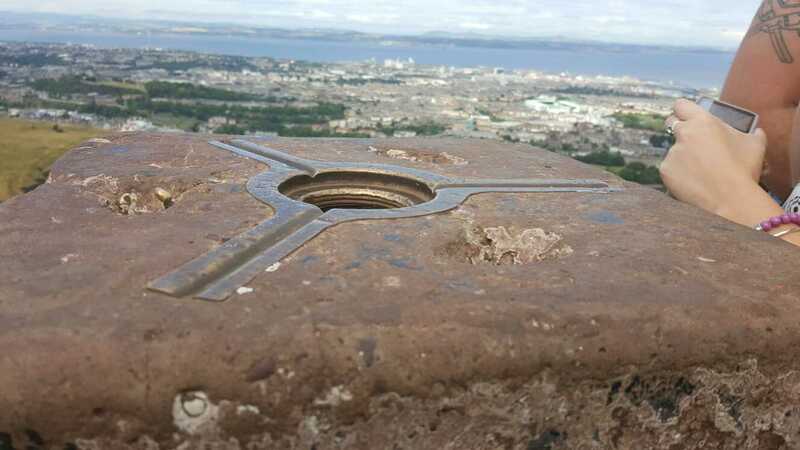 Cap missing, and view over the city. Took a very long winded route to this as Sat Nav women sent me on a wild goose chase for a parking spot, even got a royal park warning notice!. I've been up before but before trig bagging, lovely day for a revisit but couldn't believe how busy it was. 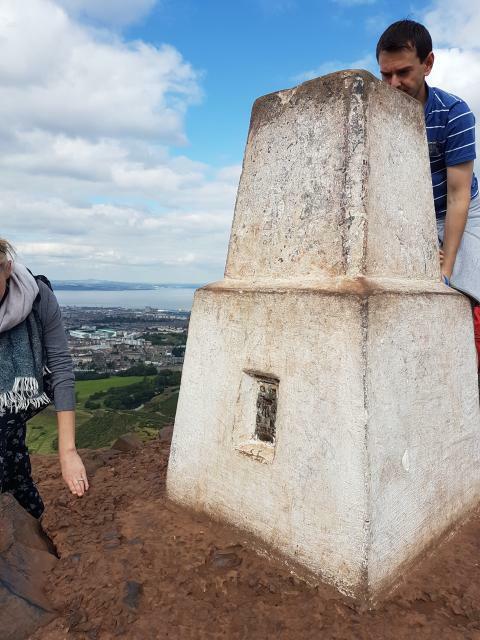 After waiting 10 minutes for a clear shot of the trig and helping people on and off as the rock is so polished I gave up and took one with people in it. Still a fab wee hill but very very busy. 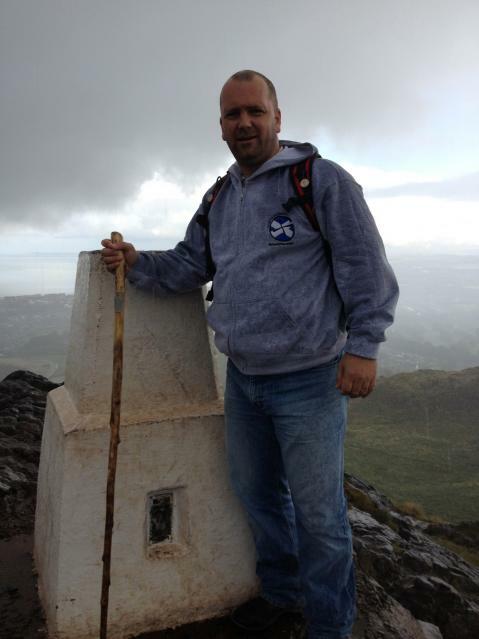 A hard slog up. Not high, but steep. It was busier up here than it was in princess street. 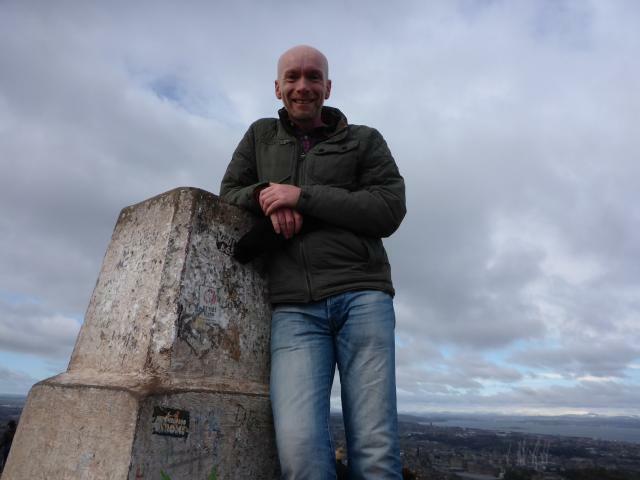 Had to queue to get my photo taken with the trig. Amazing views up here. Windy and busy as usual. Good walk and amazing views. 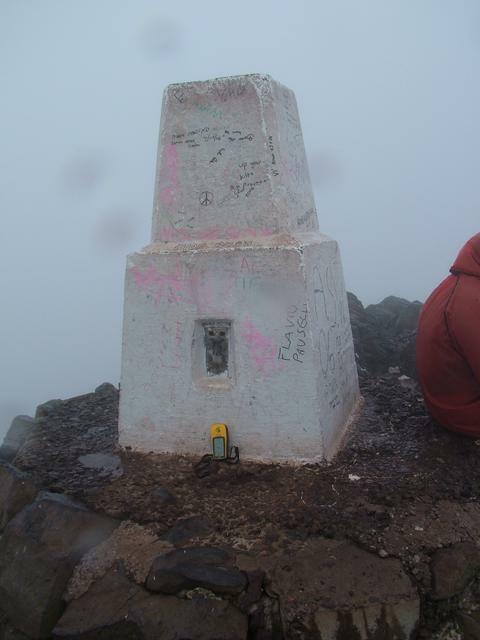 Great trigpoint. Too many people. Much better weather than I was expecting today. Some blue sky and no rain. Great views. 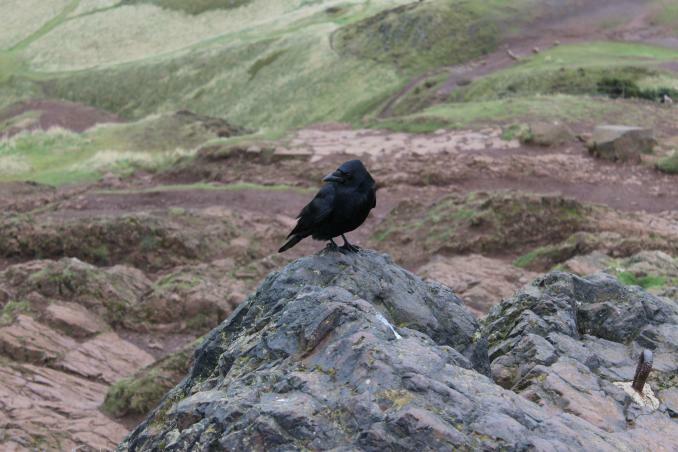 Arthurs Seat Mr Crow determined to get into the photo. 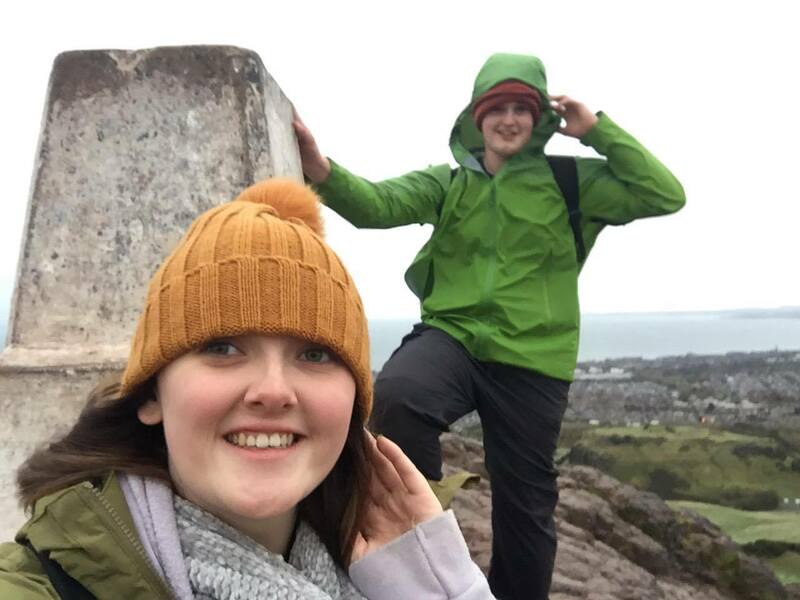 Walked up from south in dismal drizzly rain and wind we were the only ones up here, afterwards we had a very long trip home. Good views on a blustery day. Made it to the top before the morning rush. 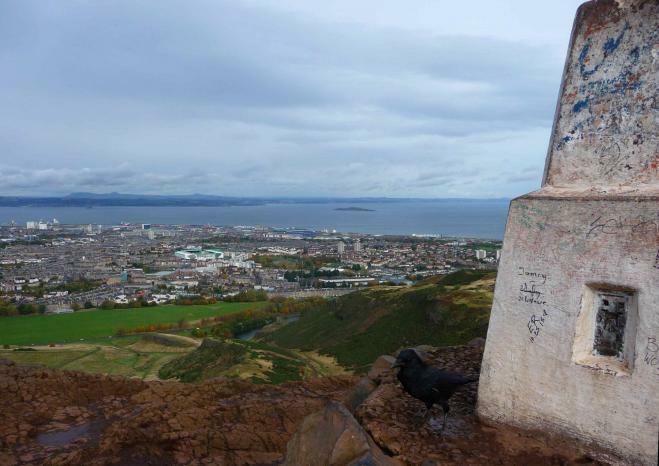 Is this the busiest pillar in the country? Another visit to include the surrounding hills. 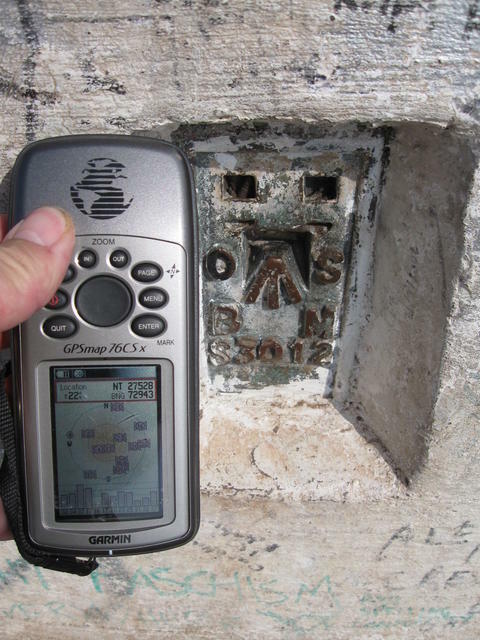 Whilst out and about geocaching. A magical spot with stunning views. 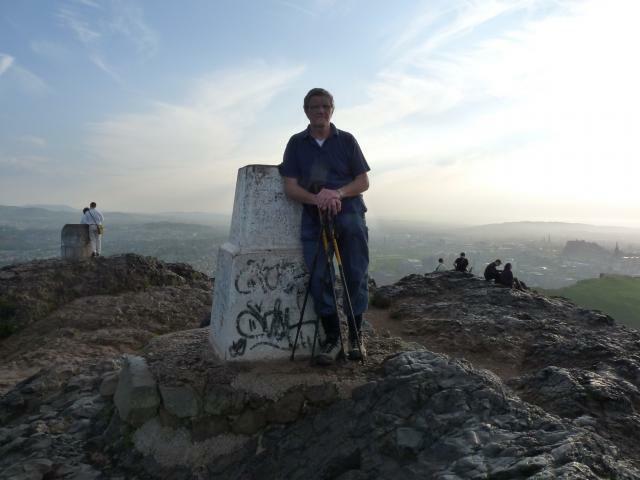 Walked up from Princess Street via Salisbury Crag. Because it was festival time, couldn't see the trig for people. Might visit again on a quieter day. Very misty & covered in flying ants! Looks a bit different in the mist this morning! 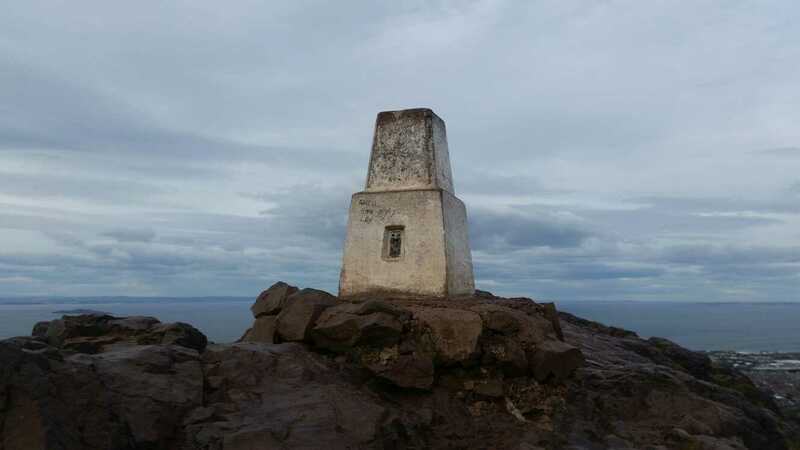 Enjoyed the walk up to the trigpoint - very windy but amazing views. I used to run up here now and then. 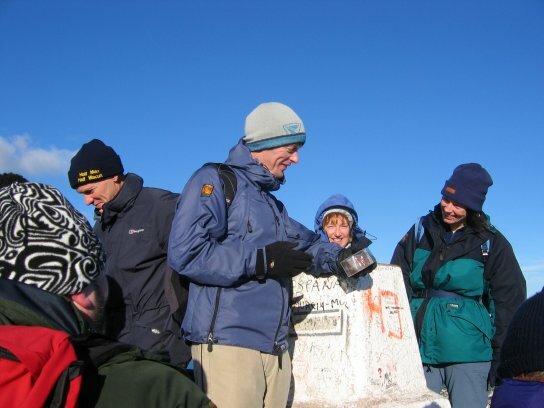 Always a very busy trig point!! 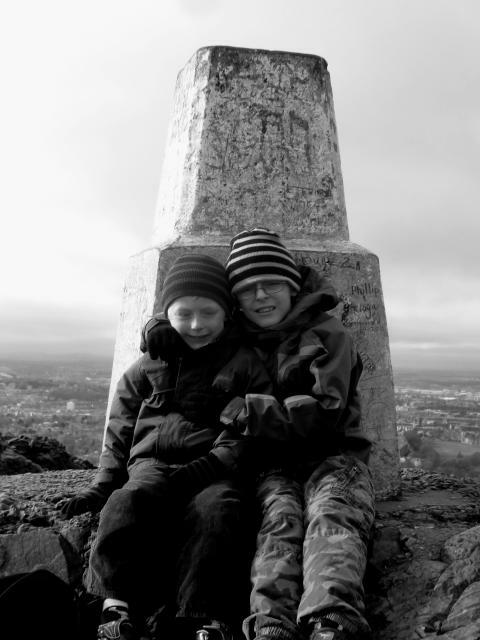 In Scotland for the weekend with THE SNAPPERS and other like minded folk geocaching. 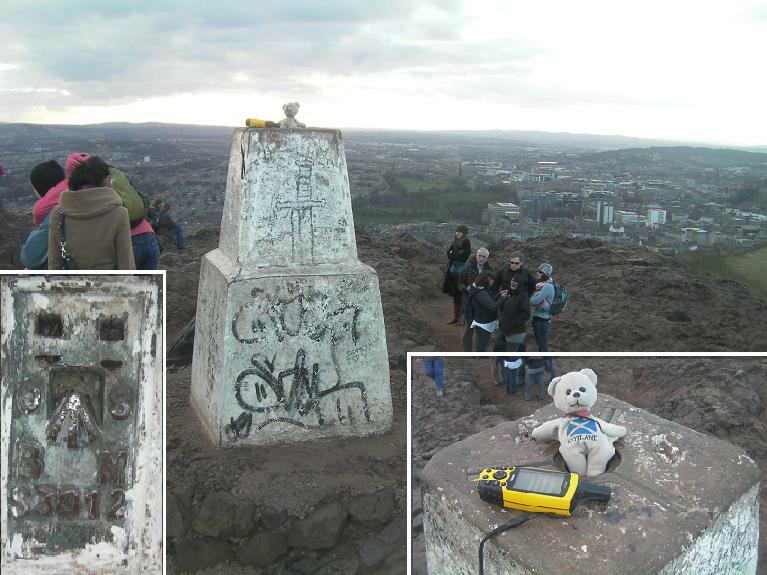 GC45CC has visited this trig so a walk up here was a must. 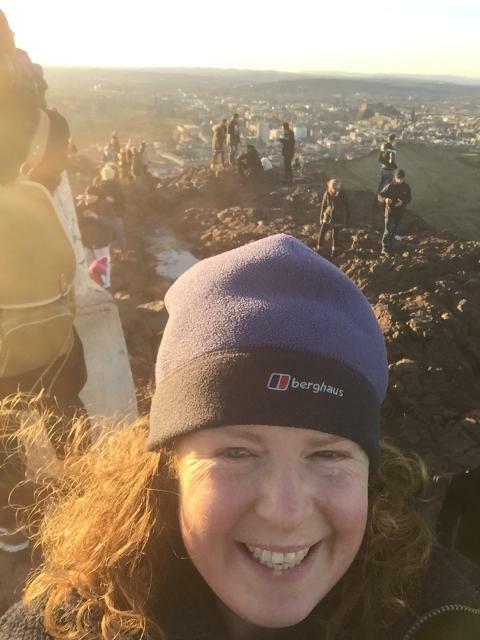 Superb 360 views from the top and a bit windy today too but glorious weather. 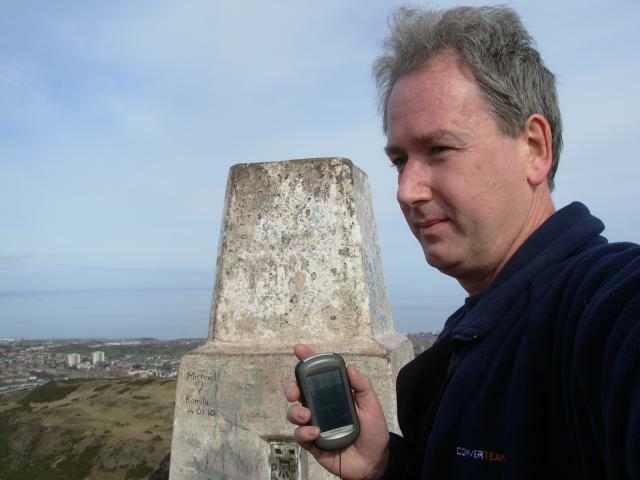 In the area caching with fellow Yorkshireman Fitzydan,superb 360'views on a windy sunny day. 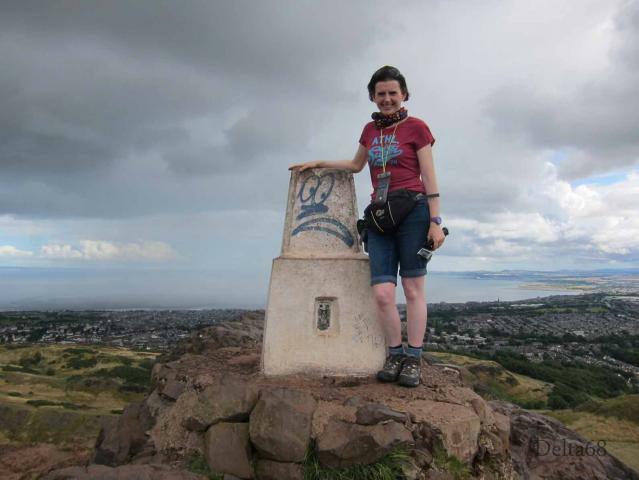 Up over Salisbury Crags,fine views over the city & out to sea. Very popular as you would expect. Wonderful views of the city from here. Pitch dark still people arriving. 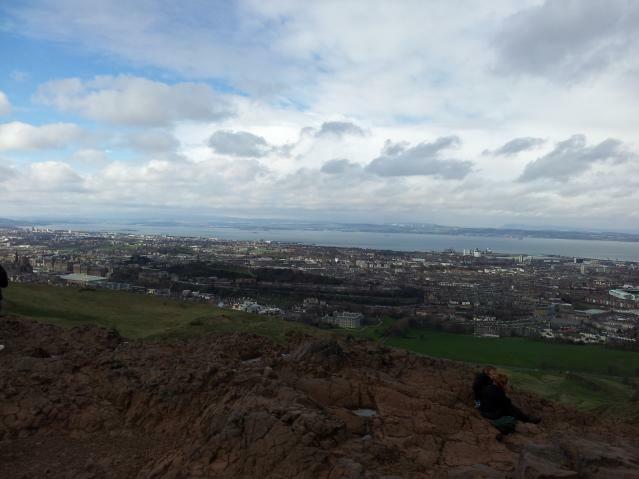 Climbed up Arthur's Seat from Holyrood Palace in very gusty weather. 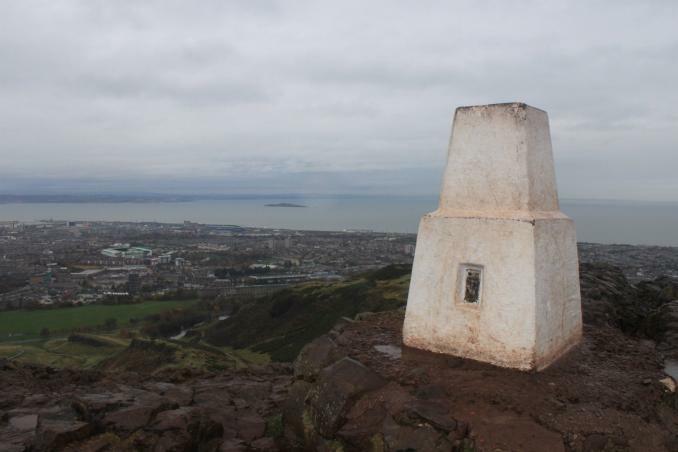 Took photos of the TrigPoint and some of the surrounding scenery. Having spent 4.5 hours on the train I needed some excercise and this seemed a good place to go. Crowded with German students. Misty but worth the climb. 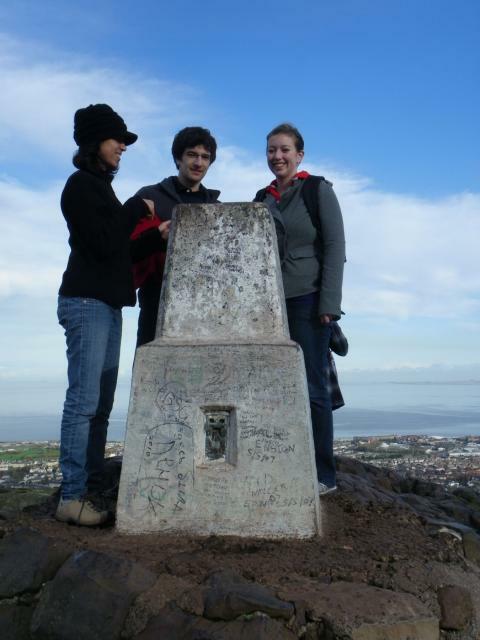 Not the first to log this trig, but it was the first time we had been up to it. And it would seem that lots and lots of other people decided to do it with us (although I think that happens every day). Cracking hill though with excellent views in every direction. Well worth the walk from the station. Revisit of many. Whole place swarming with visitors. Difficult to see pillar for people at times. 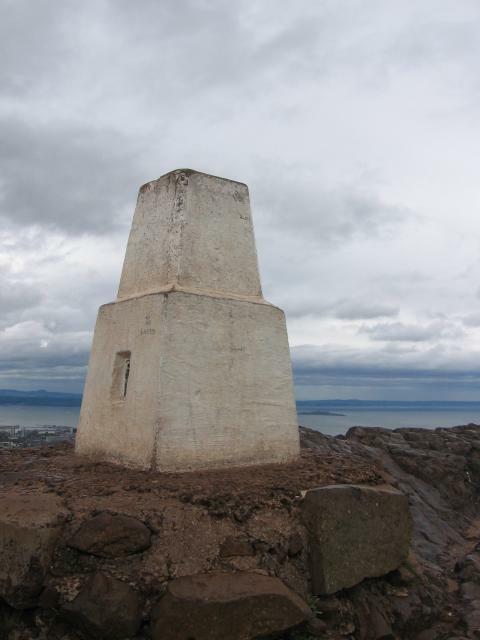 Could well be the second most visited trig in all Scotland after Ben Nevis. 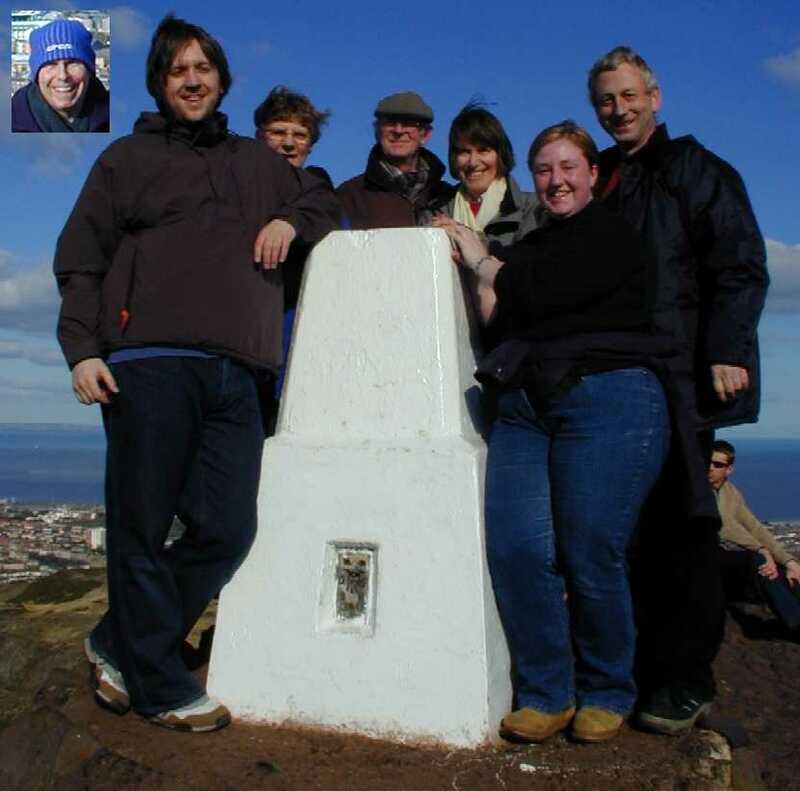 We were here to do the Earthcache and to watch Scotland versus New Zealand at Murrayfield. 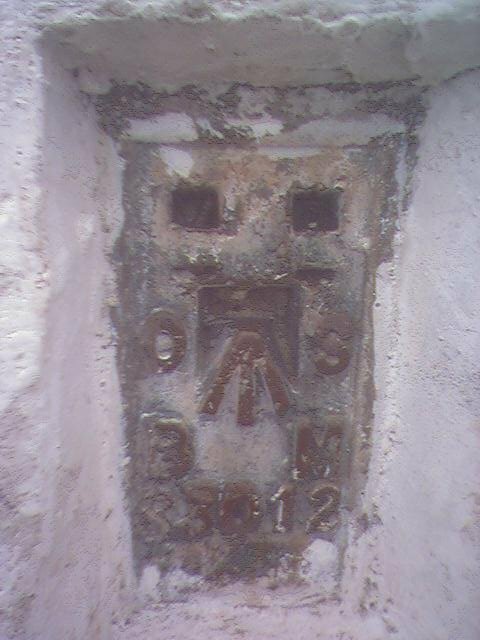 Pillar in generally good condition. Painted white, though slightly grubby. 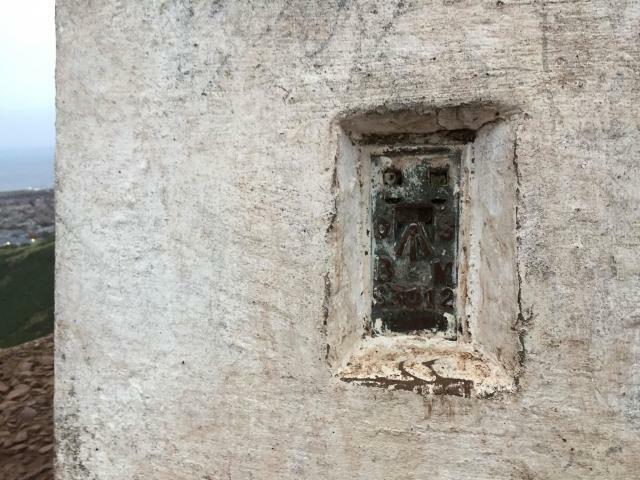 Slight damage perhaps, but no graffiti at date of visit. Excellent views in all directions. Superb views on hot sunny day. Very busy, lots of sunbathers in all directions. Very windy up here today. 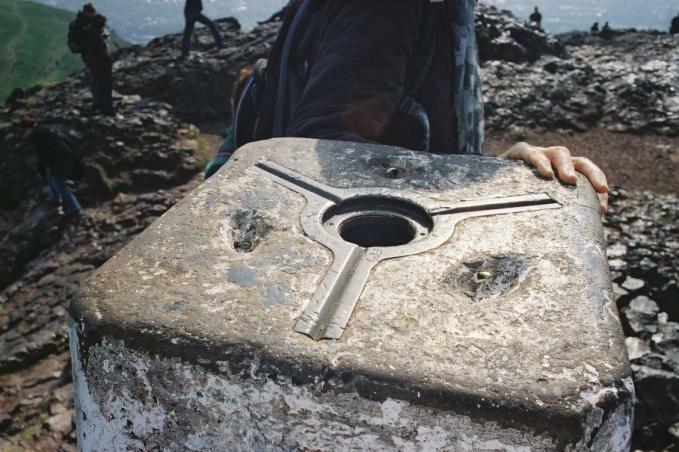 Trig was an unusual shape. Shame there is grafiti on it. 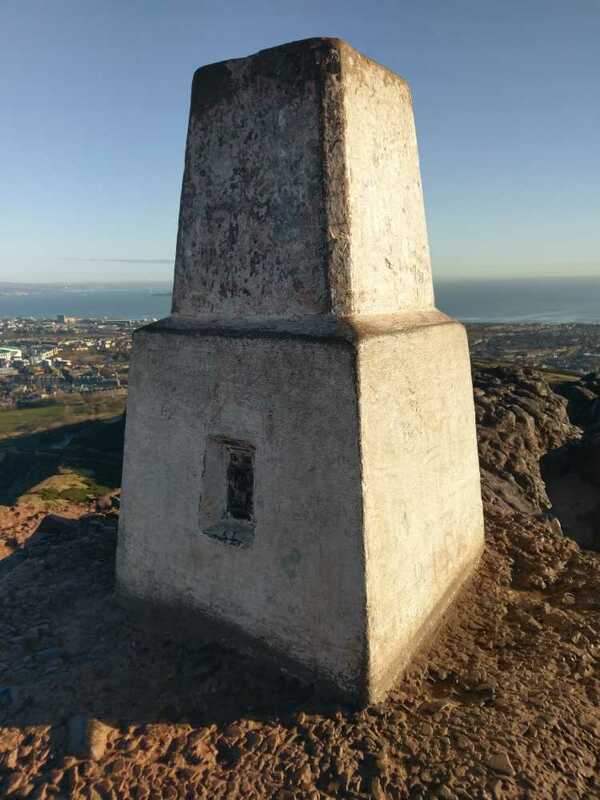 Good condition "two-stage" pillar on top of Arthur's Seat. 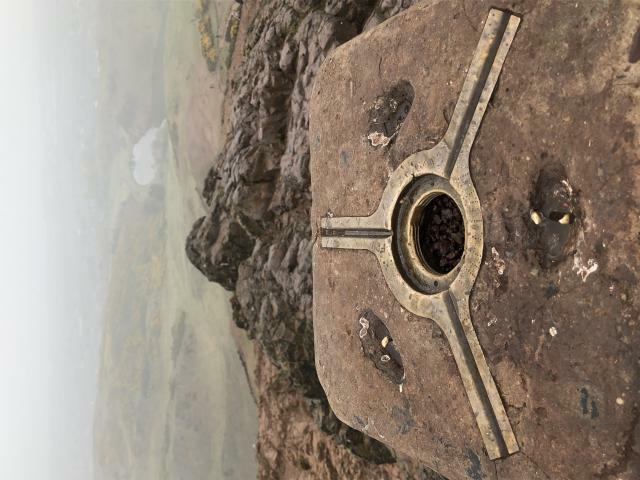 Blowing a gale today with photos only taken either by sitting down on hanging onto the hole on the top! That said, place was going like a fair. 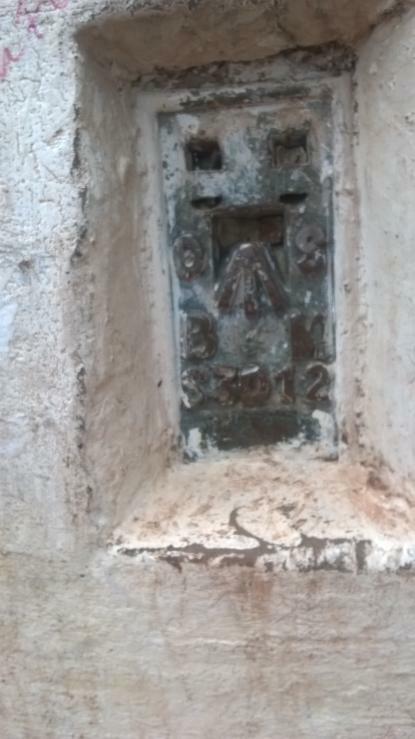 Original pillar seems encased in a new thicker base. No sightholes visible and the cap is missing with no plug. Minor chips to the top. Stellar 360 degree views, as expected. Pillar looking a bit grubby with a lot of vandalism on it now. FB faces west-ish. Busy location on a sunny but blustery day. 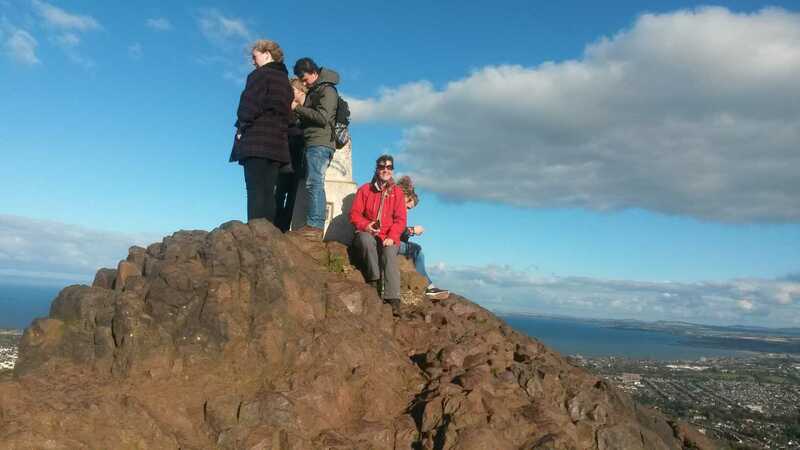 Good views over Firth of Forth and city. 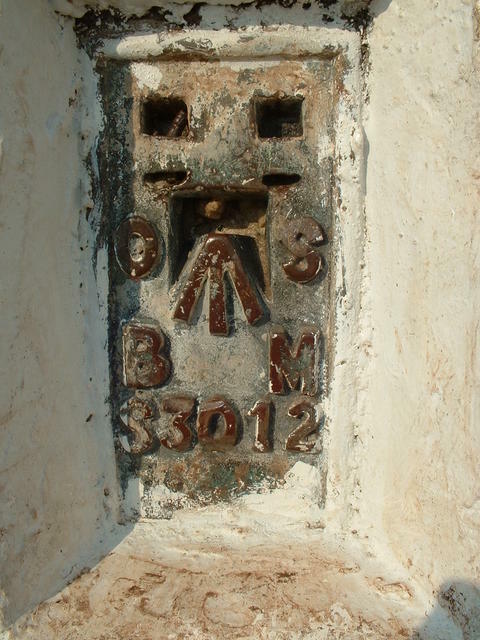 Whitewashed step trig has orange graffiti but otherwise OK. Steep climb well worth it. Walked from the City. 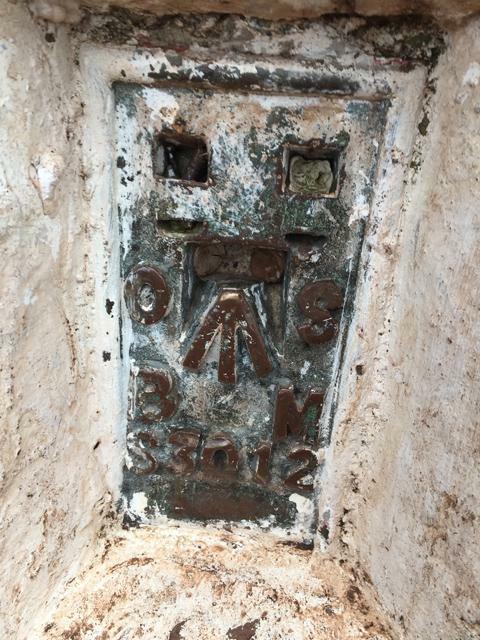 Given the location, we were amazed to find this trig hasn't been logged for about 5 months. 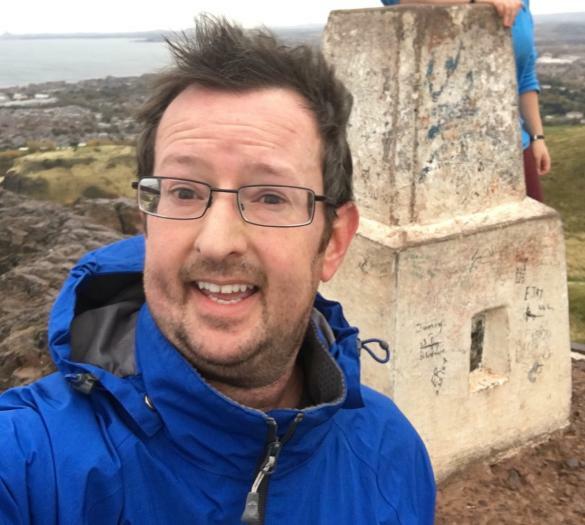 Started off from the Scottish Parliament building in light rain but at the summit visibility was down to less than 25 metres, hence the low score for interest!! We will definitely have to come back on a nice sunny day. 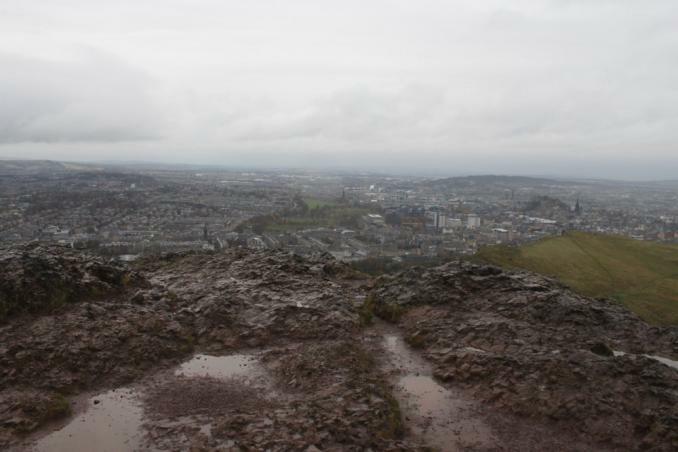 We were quite surprised to find how rugged it is on top, and quite slippery in the rain. 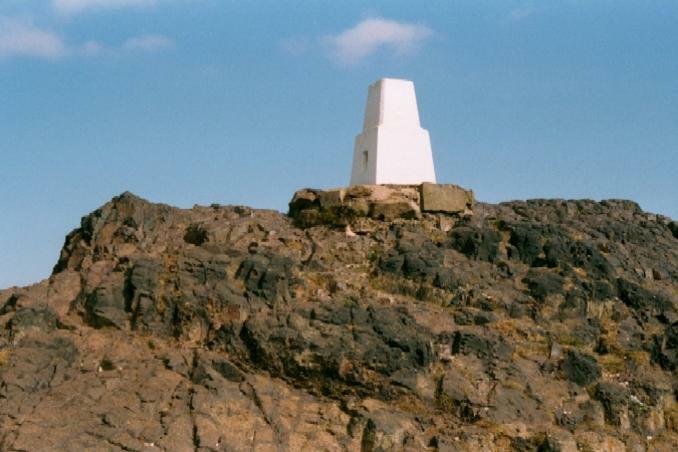 The white painted two stage pillar stands on the rocky peak of a hill in Holyrood Park to the east of Edinburgh city centre. 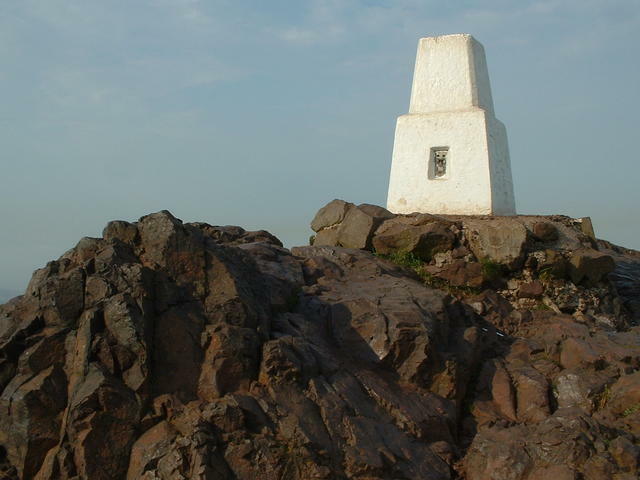 The trig was approached from Dunsapie Loch to the east. 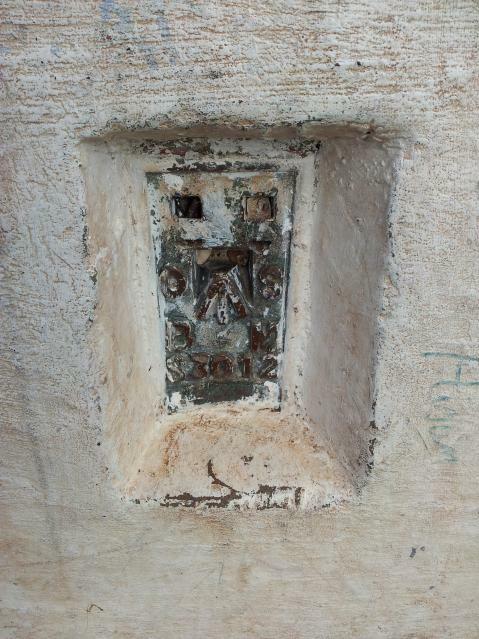 It is covered in graffiti and lacks a cap or plug. 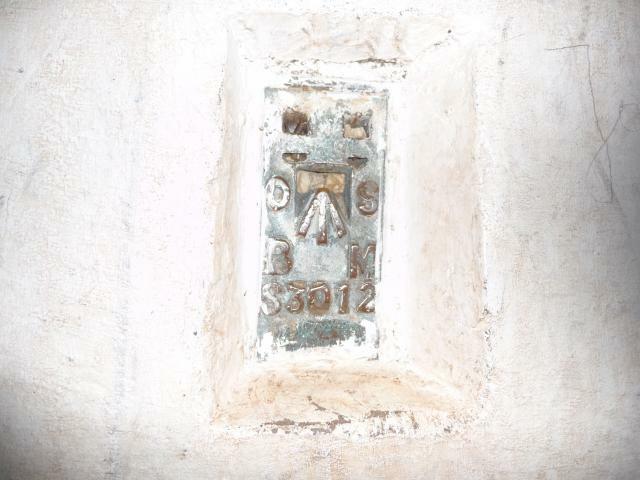 There are some minor chips to the top edges of the pillar and the loops are damaged. 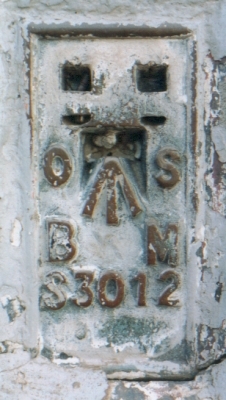 The FB S3012 is positioned on the broader, lower stage of the pillar. 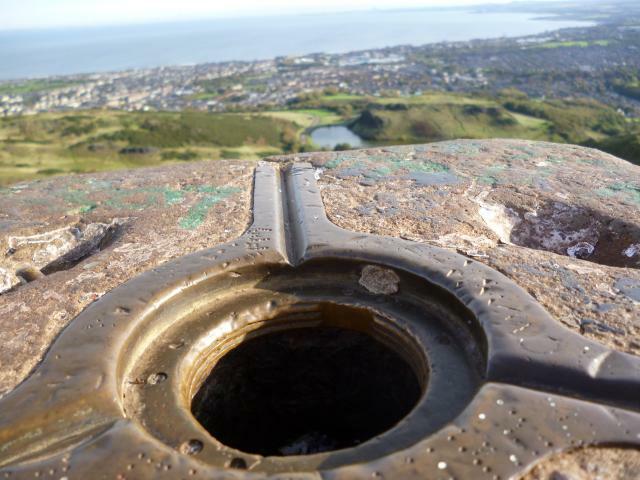 The site has a fantastic panoramic view over the city and the surrounding hills and coastline. Distant snowy peaks could be seen in the north west. 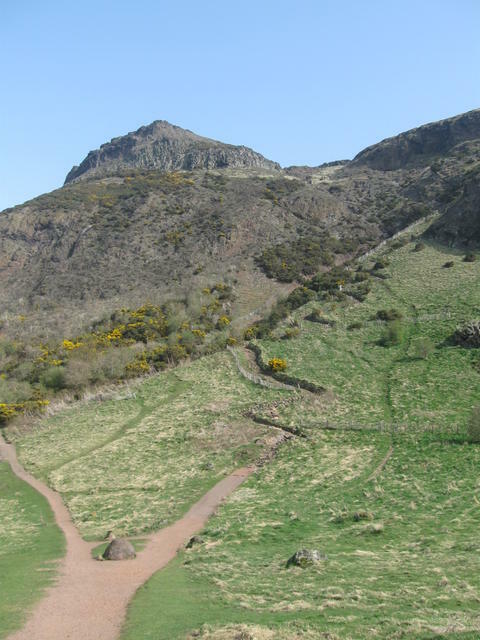 Holyrood Park is part of Arthur�s Seat Volcano SSSI. Photographed during a visit to Edinburgh, but not logged on here. A bit short of time so it was a case of park at the bottom, dash up the hill - a Marilyn no less, and dash back down. 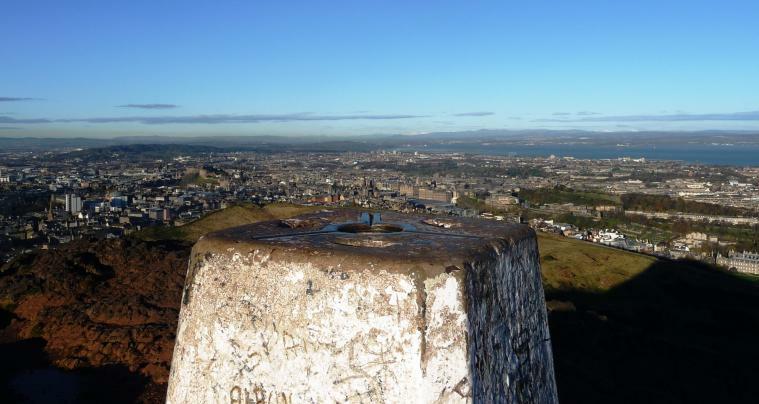 Great views, as expected, over Edinburgh on this lovely sunny day in May on our annual pilgrimage north of the border. Brilliant views of the city and beyond!! 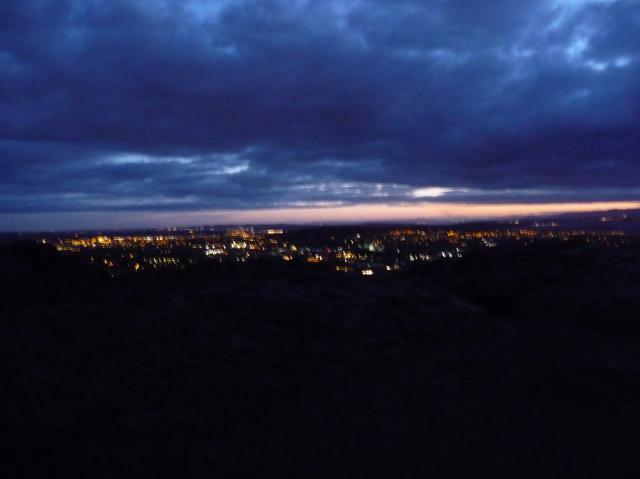 It is always worth climbing a mountain in the middle of the city. 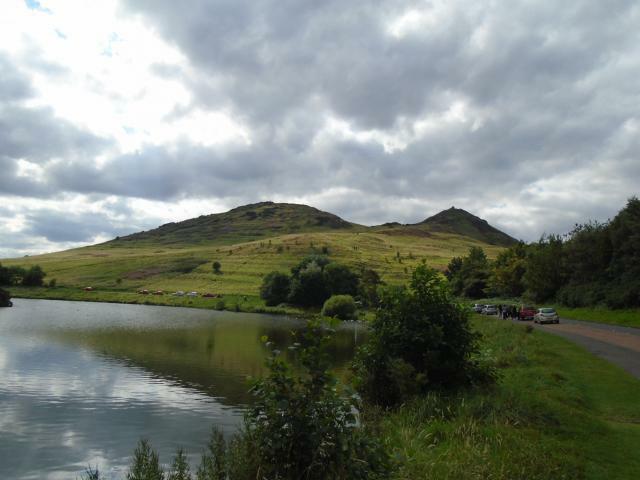 A lovely walk up here with Lorna and down past Duddingston Loch to Holyrood Palace. Very fine little hill and a Marilyn to boot. Eye-hooks on top missing. Probably more joggers per square mile than anywhere in Britain! 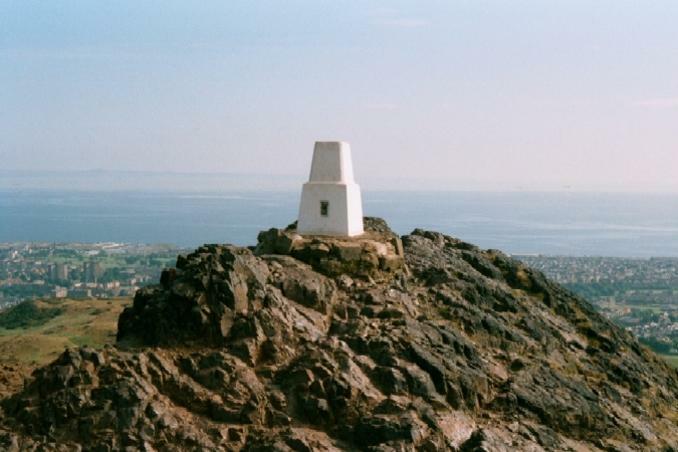 Arthurs Seat TP seen from indicator. 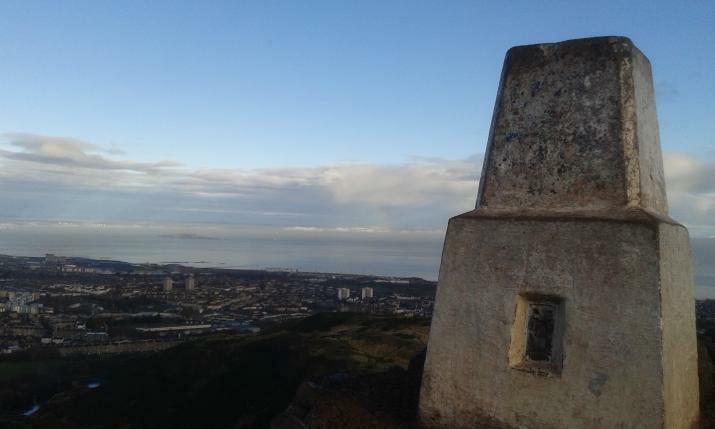 Arthurs Seat Does this data refer to the TP or the indicator? 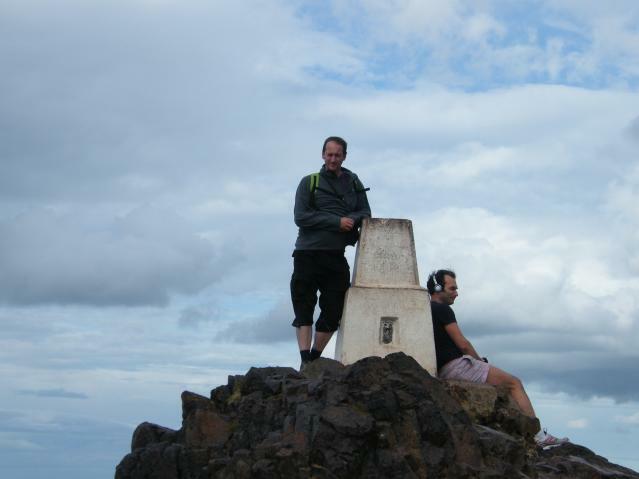 Arthurs Seat Top of trig. 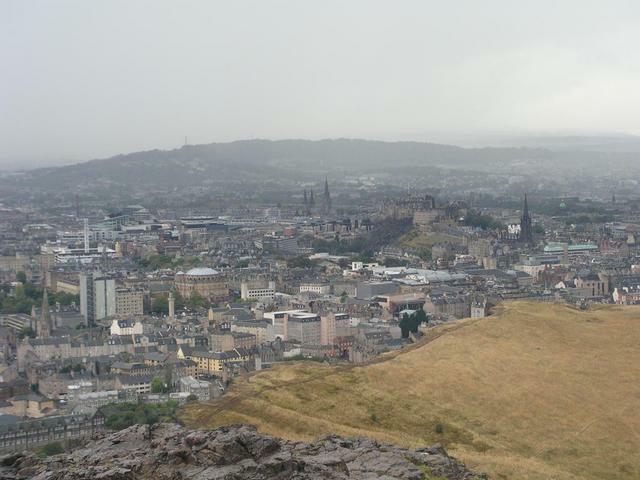 Walked up from the city centre, via the Salisbury Crags. 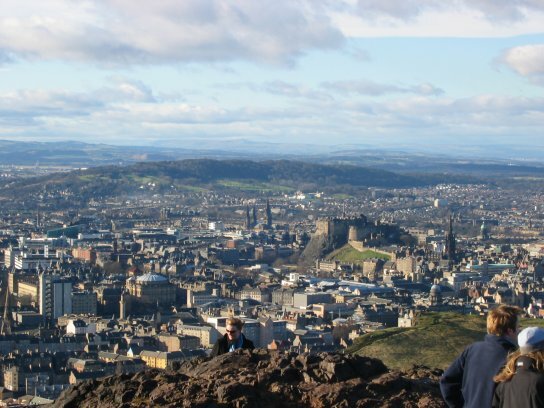 Lovely sunny day and great views back to Edinburgh Castle and beyond. 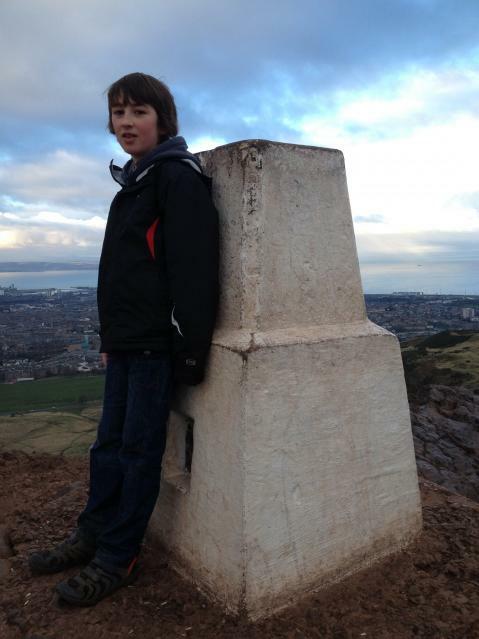 Met Declan on the way up. Made him a temporary member of the Boys from the Dyes. 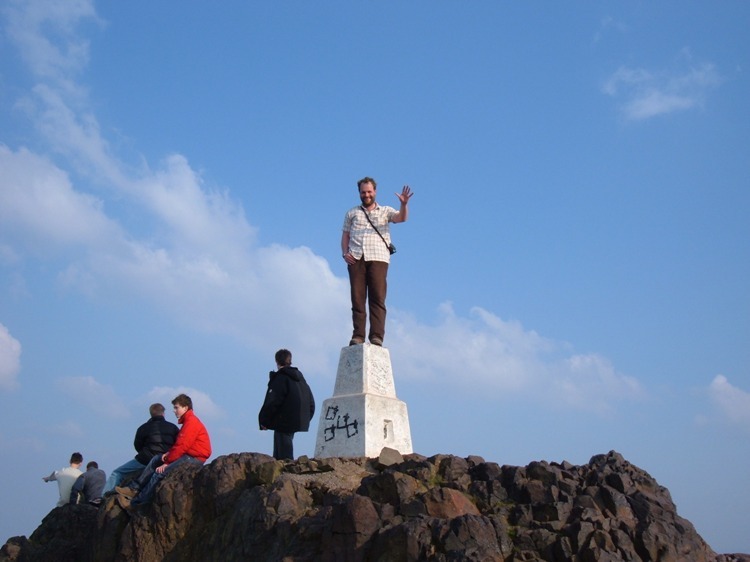 Hope when he gets back to Yorkshire he goes trig pointing with his sons. 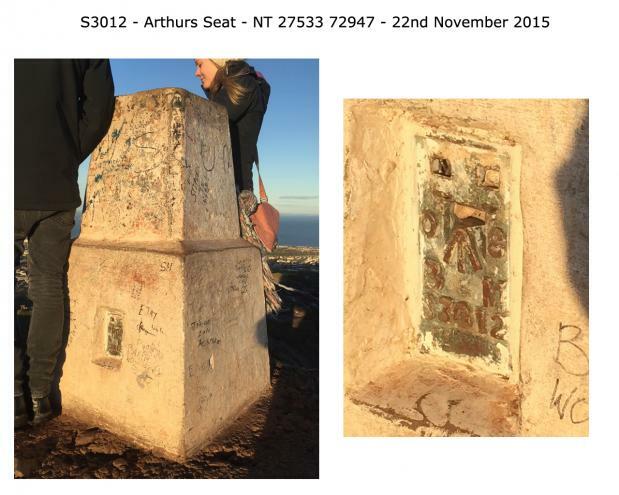 Arthurs Seat pillar and Flush Bracket. With new member. 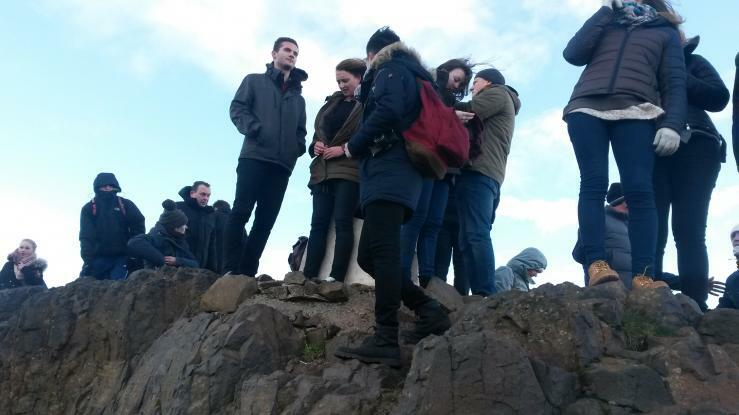 Approached from the east after walking around to the far side of Holyrood Park in order to visit the Dunsapie Tank pillar. Parked car in Queens Drive car park Holyroot palace. 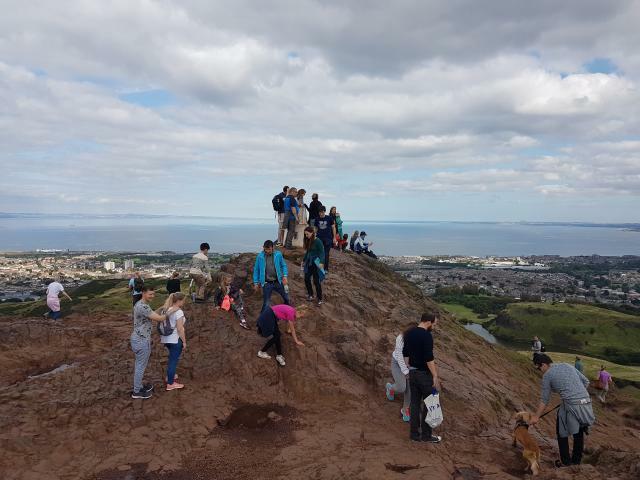 nice walk up via Salisbury crags watched a weasel in rocks on way up good nice hard climb to summit lots of people about but great views all round. 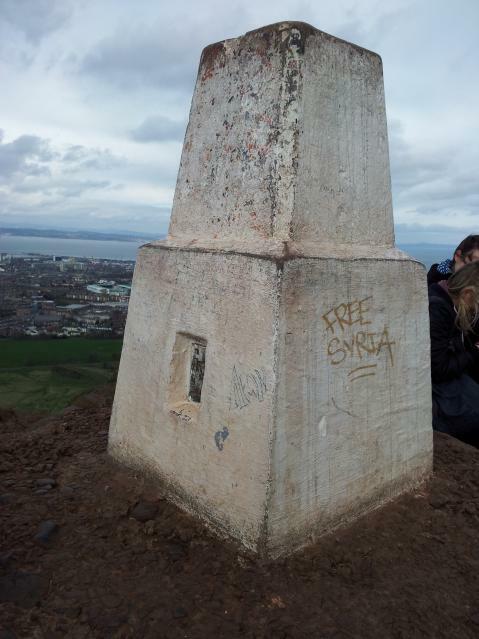 Great climb, shame about the graffite on the trig. 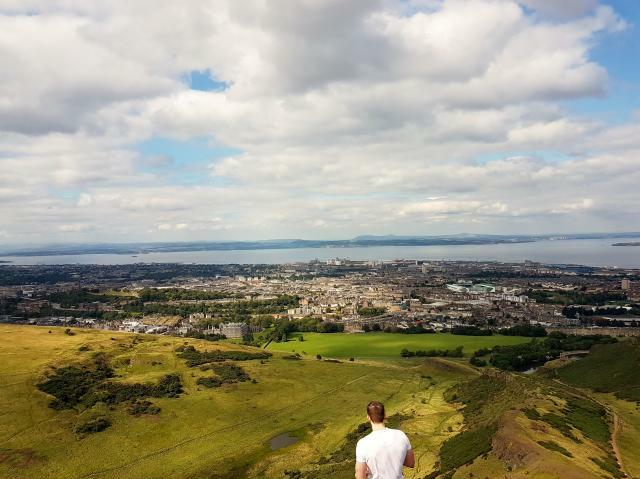 Lovely views over edinburgh. 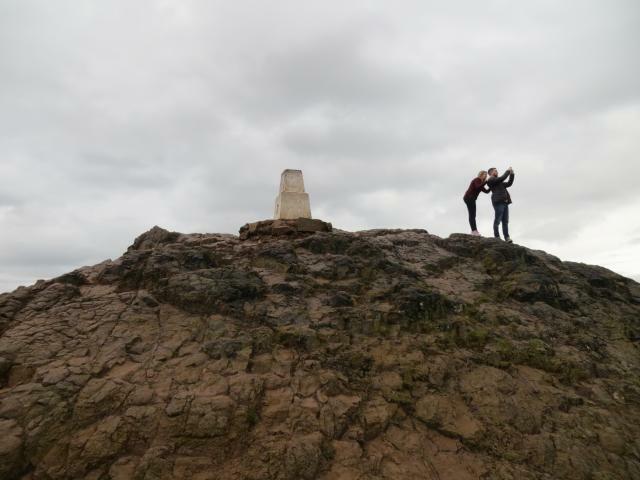 a nice walk up and great views,very windy. 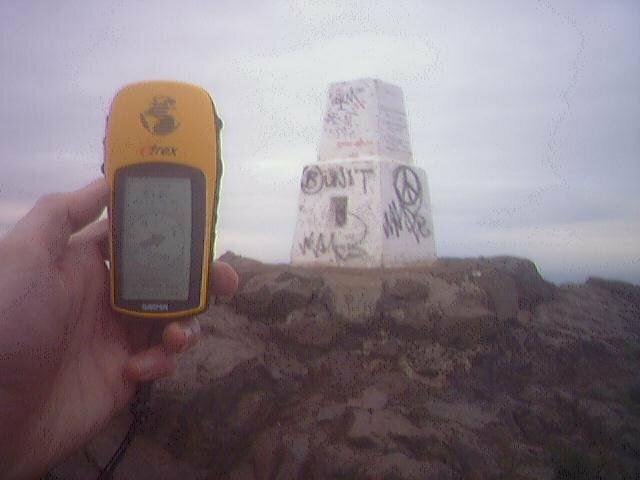 Had to log this trig as part of the EC. Superb view point. Blowing a gale. 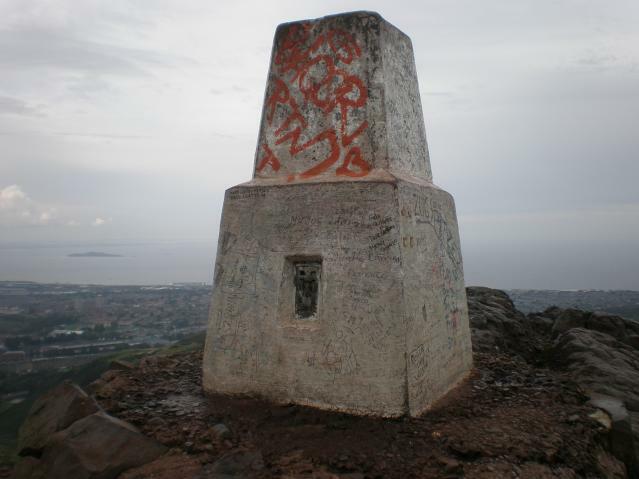 An interesting trig, defaced by graffiti. 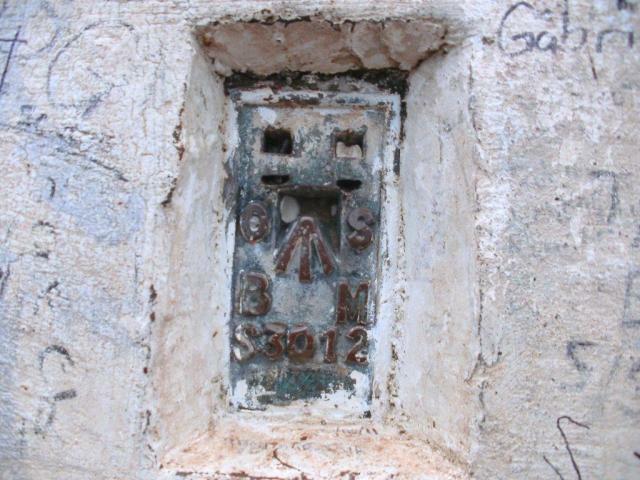 Great routes up here, shame people have to write all over the trig ! 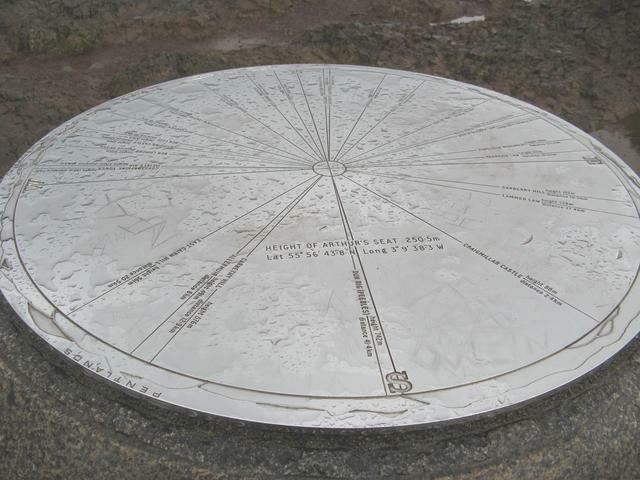 There are routes to this trig from every point of the compass. 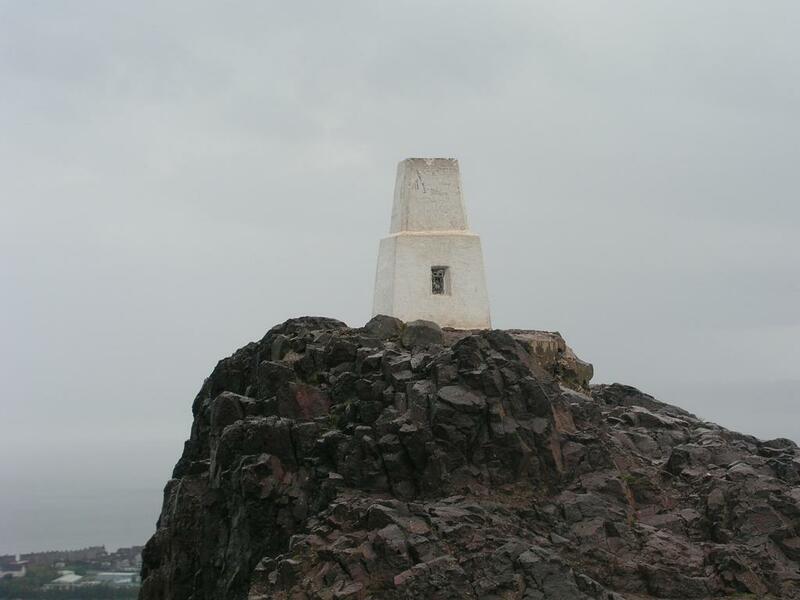 It was a lousy day on our visit with persistant heavy rain and hardly a soul about. 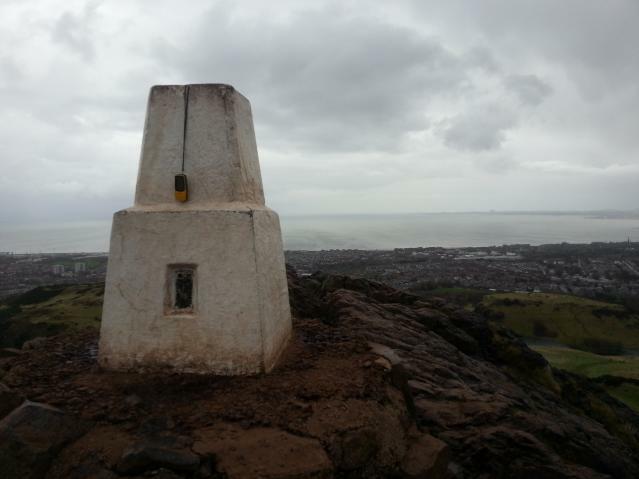 The rain abated a little upon reaching the trig and we got a view of sorts, just a glimpse of how good it may be when the suns out. 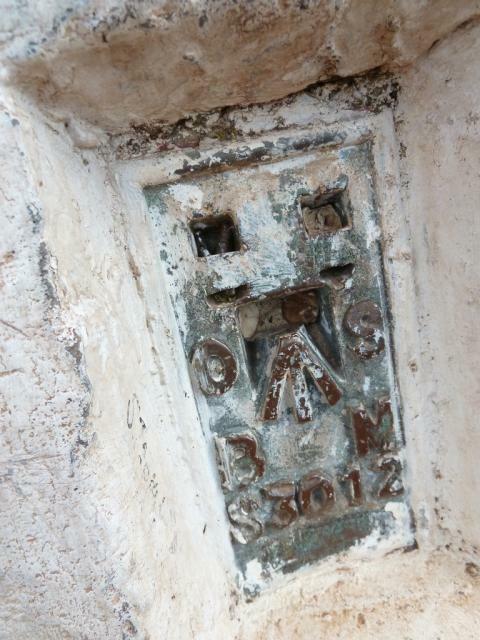 I think this pillar is in good condition, spoilt only by the graffiti. 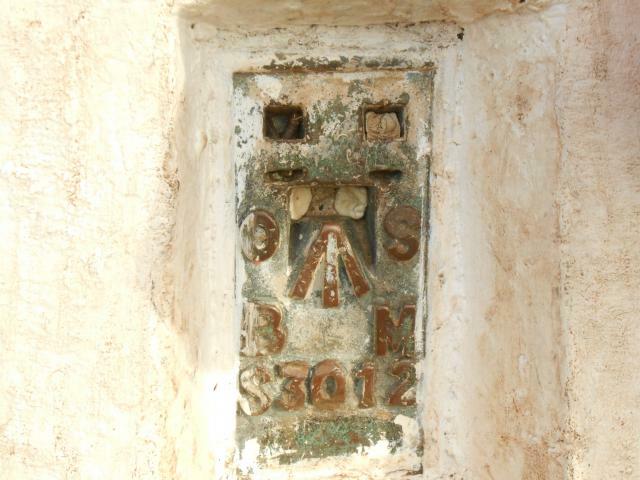 See the earlier photos by Clochandlighter on 20/04/2003 to see how bad it was before the repair. Revisited on 23/03/2010 with daughter in much better conditions so Ive upped the score a couple of points. As good a city scape view as youre ever going to get. The vandalism & graffiti I just dont understand, whichever way you come from youve got to make at least some effort to get to this trig, so the spray painting and physical damage would seem to be pre-meditated, why on earth would someone undertake this, and surely given its popularity you would have to time your assault on it quite carefully as otherwise surely the other visitors would give you grief? 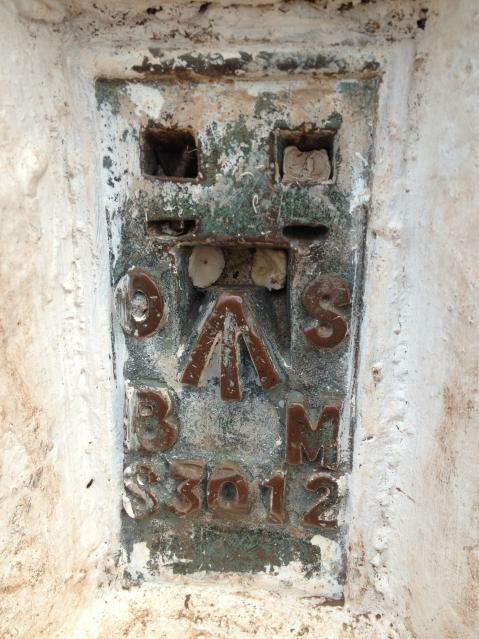 Plug missing, top edge chipped, 2 restraining rings broken. 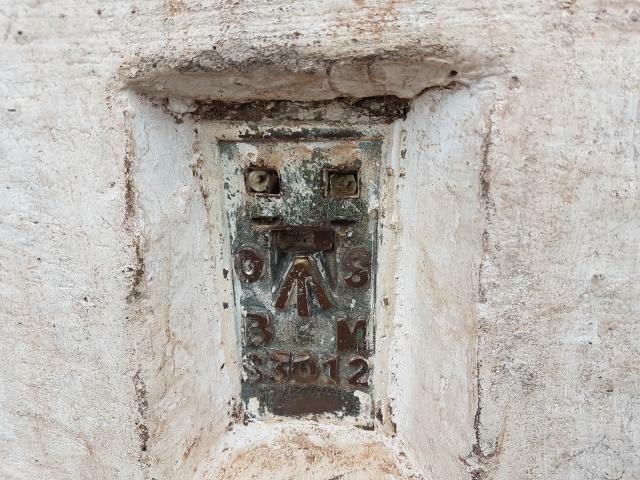 The remaining restraining ring has 3 padlocks clipped to it. No open sights. The TP has grafitti by people from all over the world. 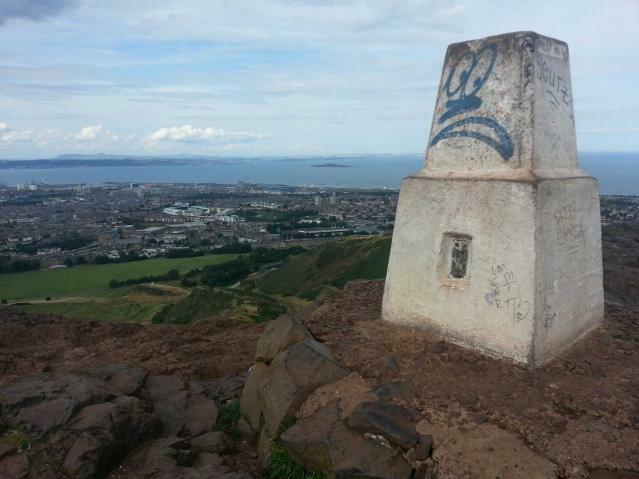 Excellent all round views from here and a very good view of Edinburgh. 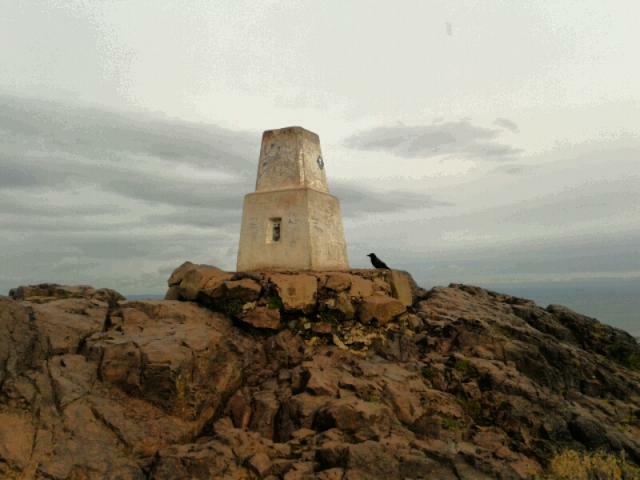 There is a another man made piller on this hill which has details of the horizon to help with your viewing. If any of you ever visit Edinburgh then you must come up here. Revisited with my Sahara Squad on 27-2-11 for GPS. 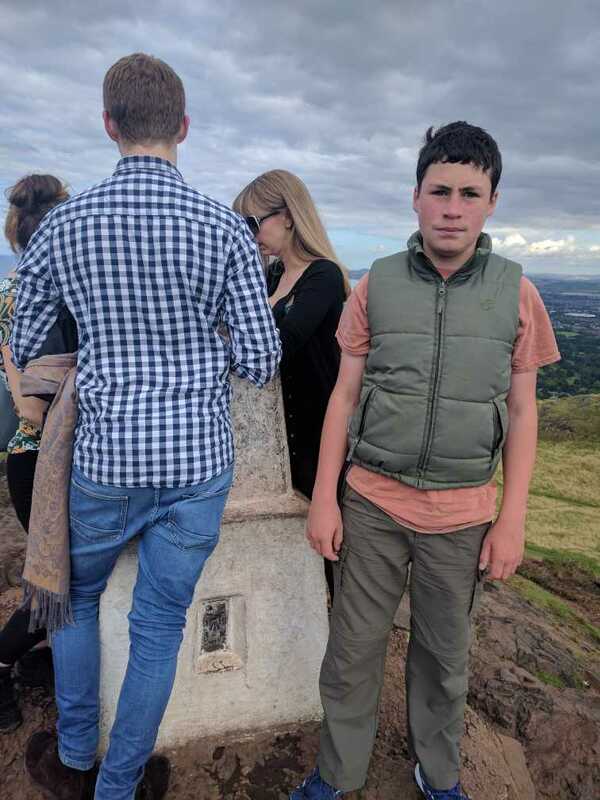 Fabulous views from this busy auld volcanic plug... spoiled only by the excessive graffiti on the pillar... regular whitewashing might be in order. Love this spot. Have been several times but this was whilst in Edinburgh for the tattoo. What a wonderful city - always love coming here. 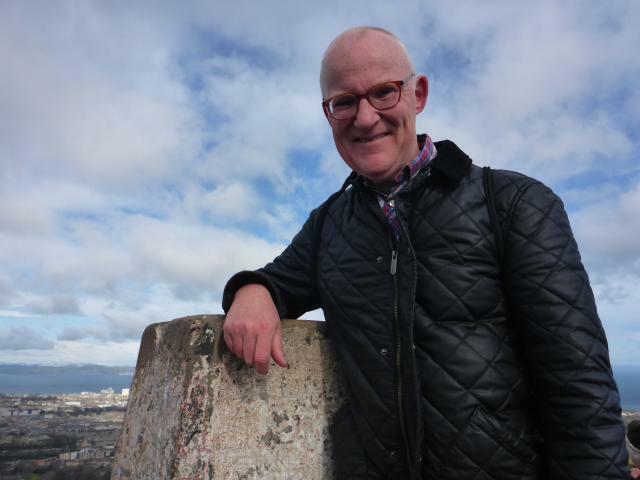 Now thanks to my daughter actually living here (rather than her last residence: Dunedin, New Zealand, the 'Edinburgh' of the south) I hope to enjoy it for many years to come. 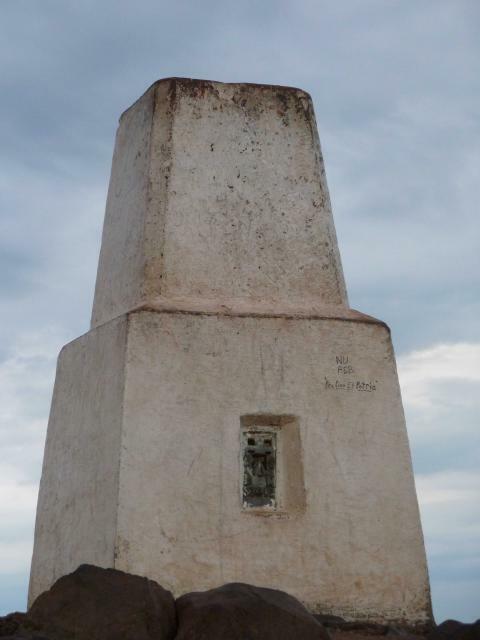 Actually had the trig to myself for some minutes - caught a lull in the procession to the top. 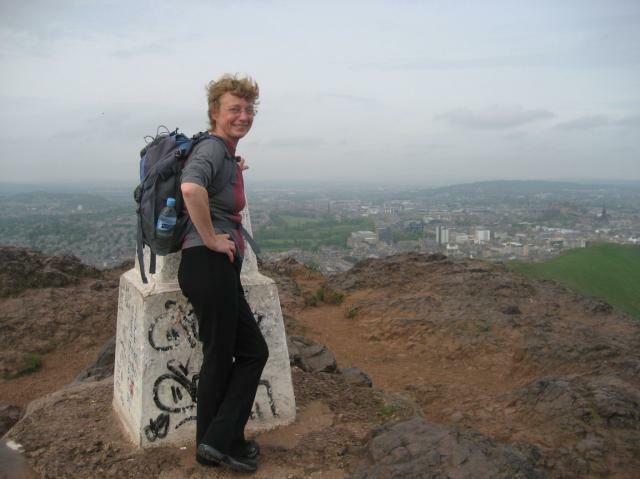 A fun scramble, and marvellous views (considering that it looks down on to a city!)... Reminded me a bit of Table Mountain in Cape Town! 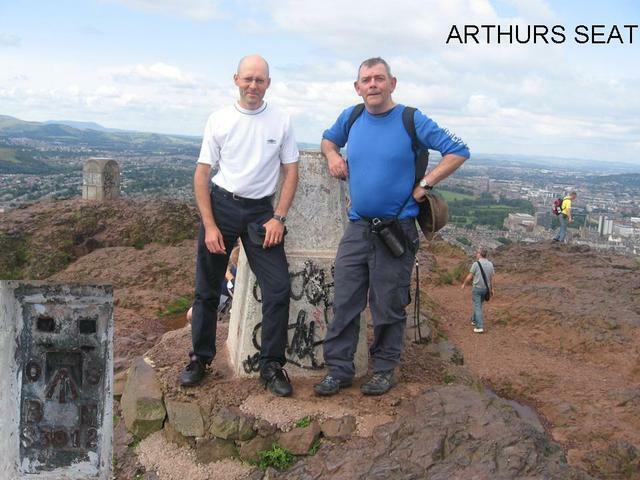 Up Arthurs Seat for the Earth cache. Pillar covered in graffiti but otherwise in good nick. 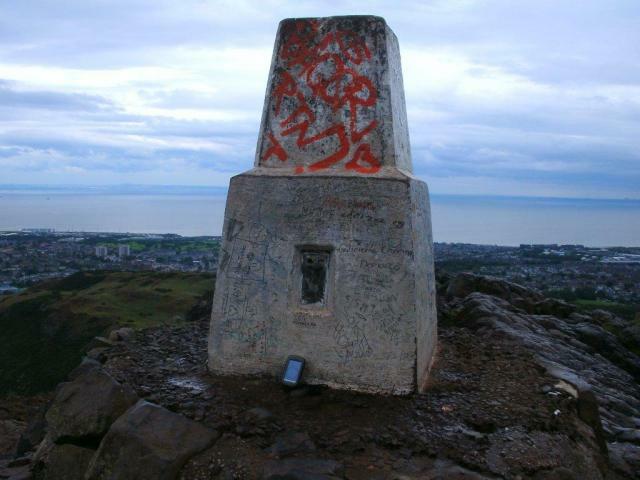 Rather graffiti'd unfortunately but what can you expect on such a prominent trig point. Flush Bracket damage to the flush bracket. repeat for me but Marilyn bagging mode for Jamie with me and him homing in on 500 for me and 100 for him the next day. splendid views in all directions. very busy even in january, but a delightful peak nonetheless. my wife was rather less enthusiastic! Great view! Quite a popular spot. 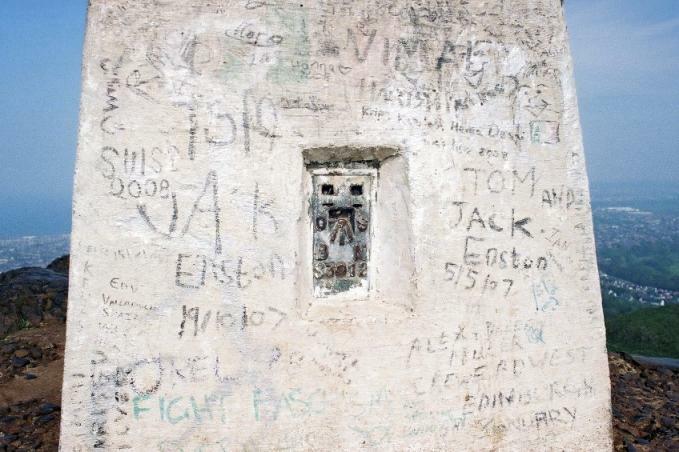 Fair amount of graffiti on the pillar. Can not give this a top rating as the waether was awful up here today. Misty and wet. 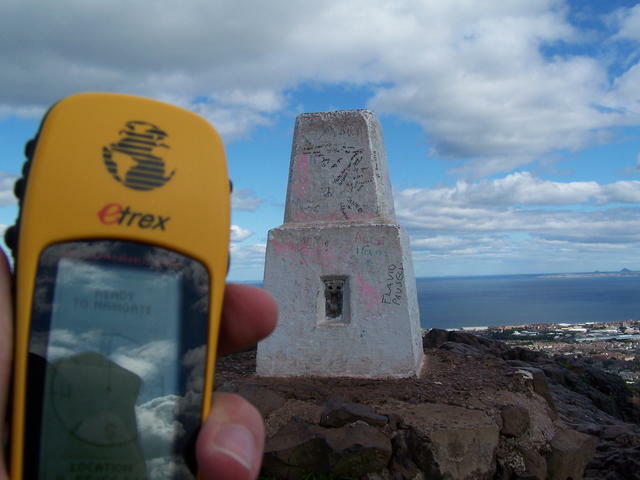 Still able to find the trig OK though. 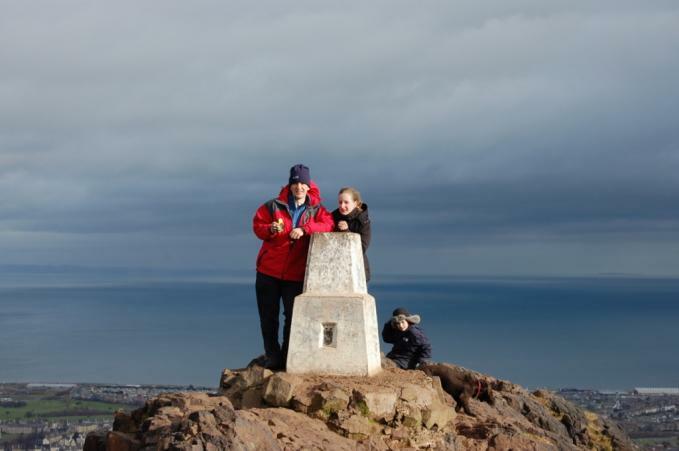 Fantastic views across Edinburgh and out to sea. Mint trek up to it as well. 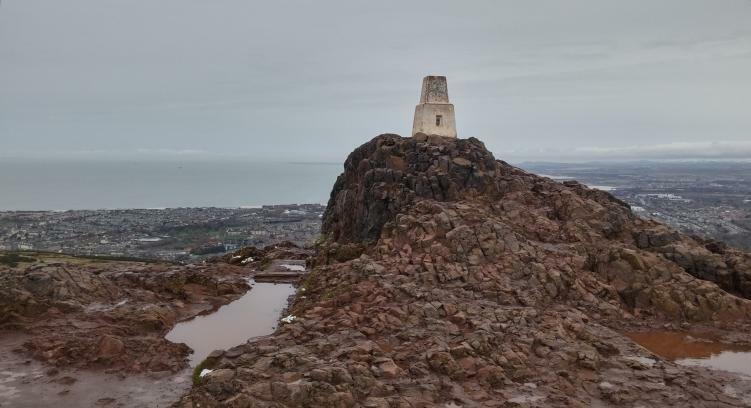 What a great place,fantastic views over Edinburgh.I was working in the area and could not miss this one.Hit town bang on the rush hour and so was very glad when I could finaly get out of the car and start walking.It was a great climb and a great reward with the views over Edinburgh. This pillar is sporting another fresh coat of paint. No graffiti yet. Lunchtime visit with six colleagues. Great visibility all round. GRP. 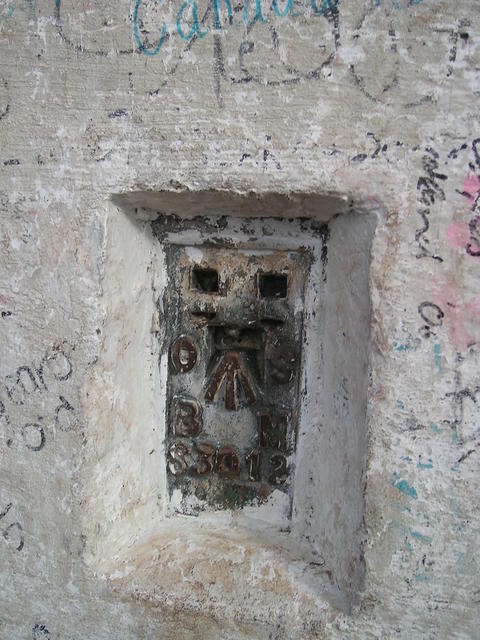 The pillar its self is structurally sound but has had some repair over the years and is currently covered in graffiti. The view is stunning and I highly recommend the trek to all because of it. 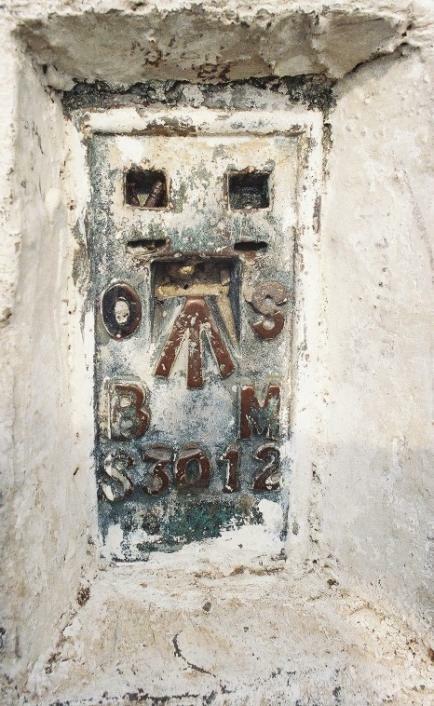 This trig was repaired by a local contractor on behalf of the Ordnance Survey, June 2003. 4th nearest to home. Visited many times, most recent visit 02/01/2006, GRP. The New Look. 26/06/2003. Recently repaired and repainted. 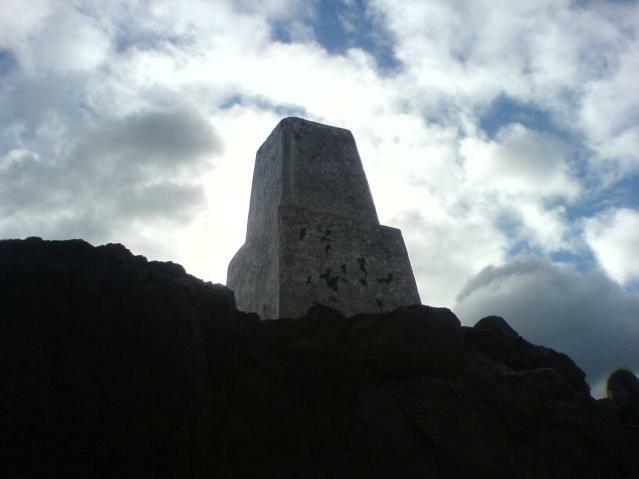 The summit. 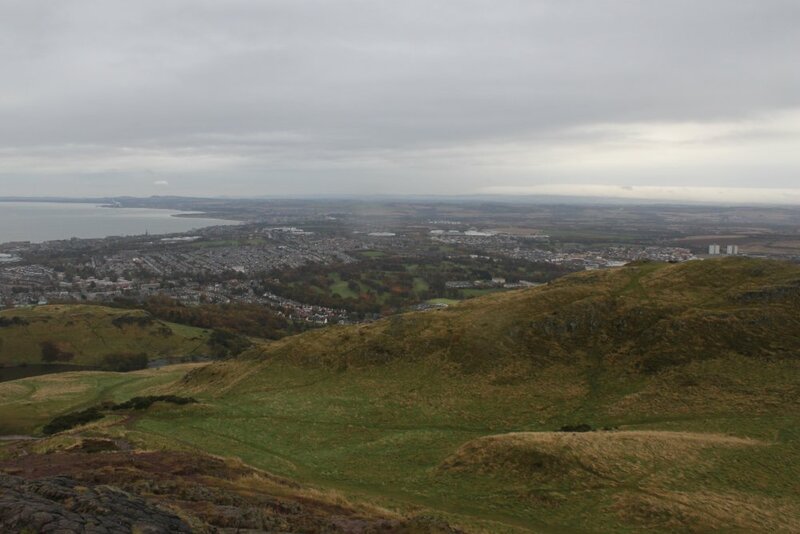 View over east Edinburgh and the Firth of Forth. Solid as a rock. 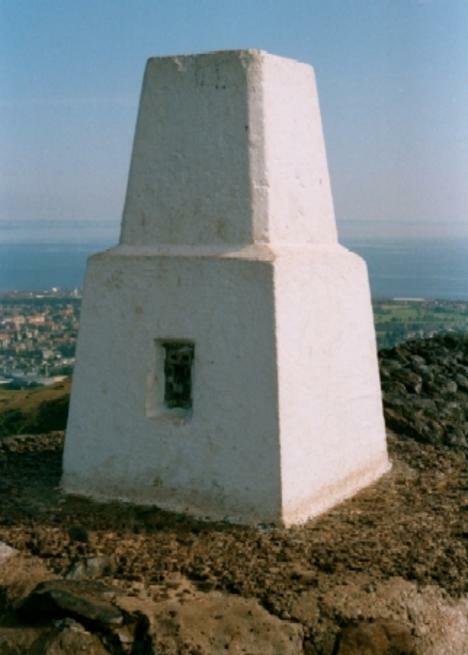 The rebuilt trig against a clear blue sky. 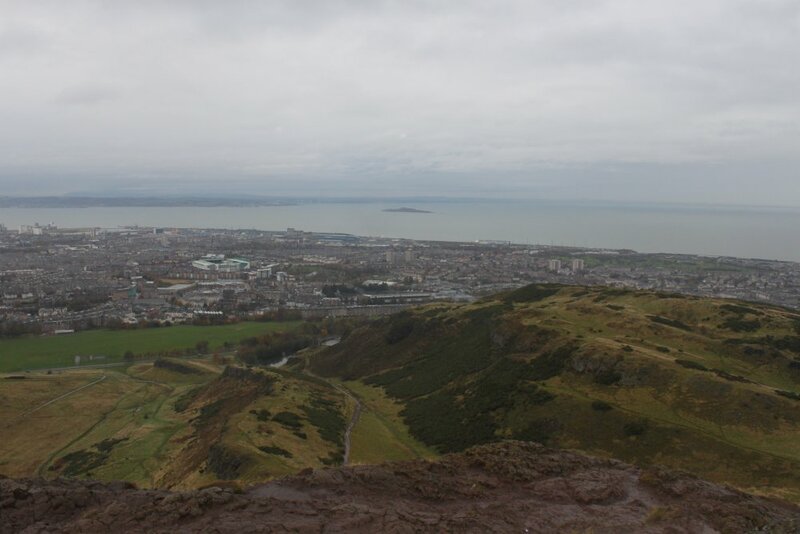 Walked up through town from the George Hotel via Salisbury Crags. Not much of a view due to the rainy and misty conditions. Second of three today in sunshine. 30/1/05Up again for a 600th Marilyn Party. Well done Rod Munro. 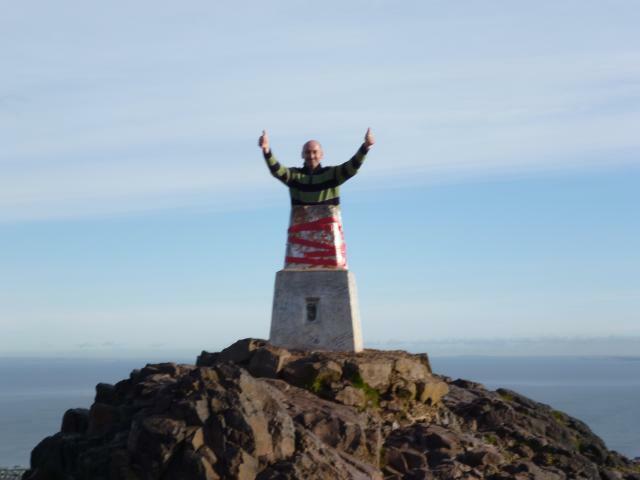 An interesting day as I was orienteering on the hill in the morning (ie ran up) and then met up afterwards with the happy band of baggers.HoF Chant unleashed on the masses. Still in good shape and another cracking day for views. Today's whisky was Glen Ord. 22/4/05 Quick afternoon visit on cool sunny afternoon. Busy as usual, no change in condition. First visit for a few years. Big changes, pitched paths and a reinforced trig pillar. OK except for the inevitably missing plug and graffiti. Great view again, and very cold, puddles iced over. Snow on the Pentlands. A few other morning visitors. Good to see an old friend again. -----27/7/04 Muggy evening, covered in flying ants. Pillar very heavily graffied now - perhaps some are best not painted white. -----13/10/04 Lunchbreak visit. Pillar which is now chorten shaped is now decked with prayer flags. 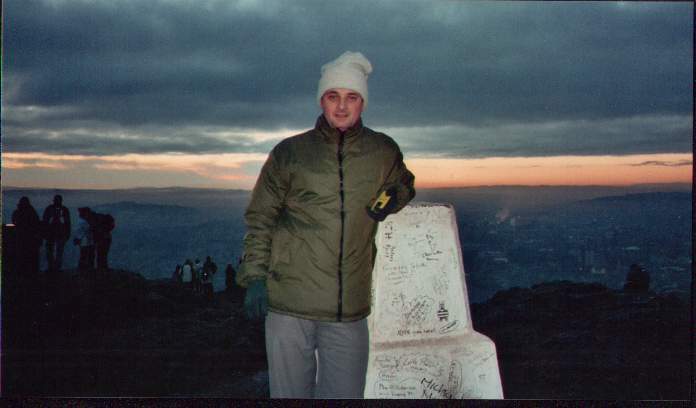 ------18/12/04 Cold day but a suntrap just below the summit. Up with the Desparados MC (no connection) christmas meet. 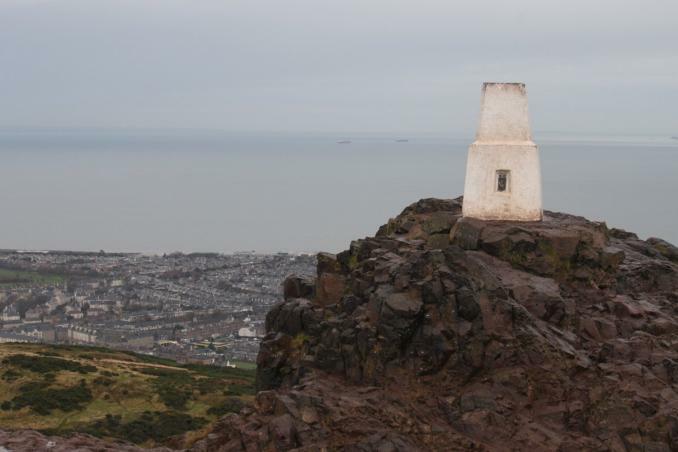 Much mulled wine and mincepies and a lovely view of the Southern Uplands from Bass Rock to the Coulter Fells. Braved the wind for a view of snowcovered Highland hills. 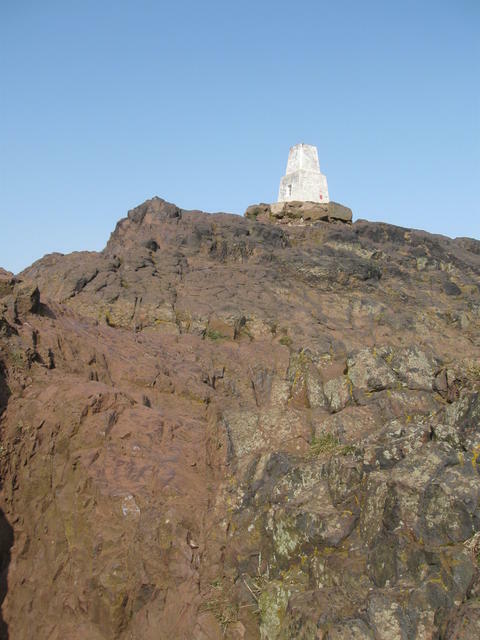 Arthur's Seat The butressed trig, no prayer flags today. 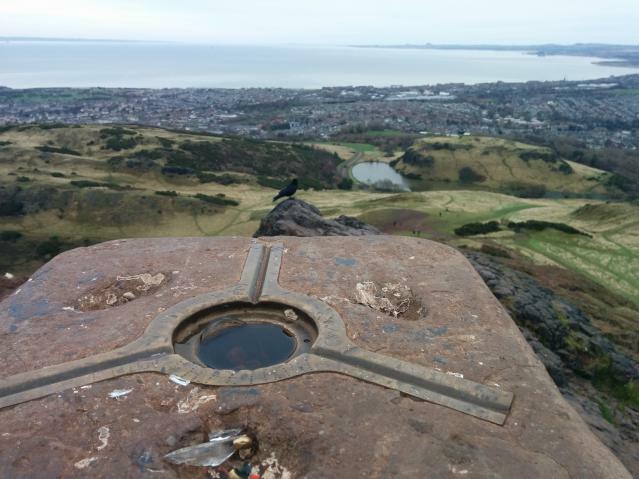 Arthur's Seat One O'clock gun. Midlothian. 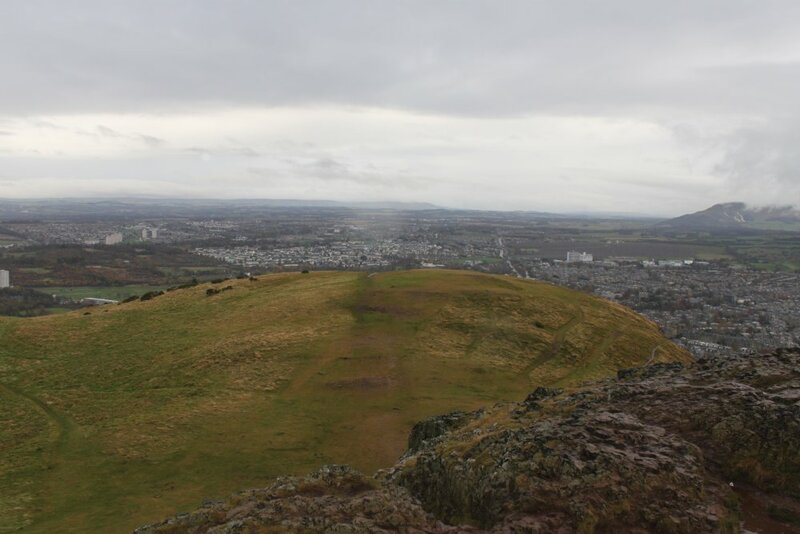 Dark clouds were threatening to come in from the north but the rain held off until I was back down to Holyrood. 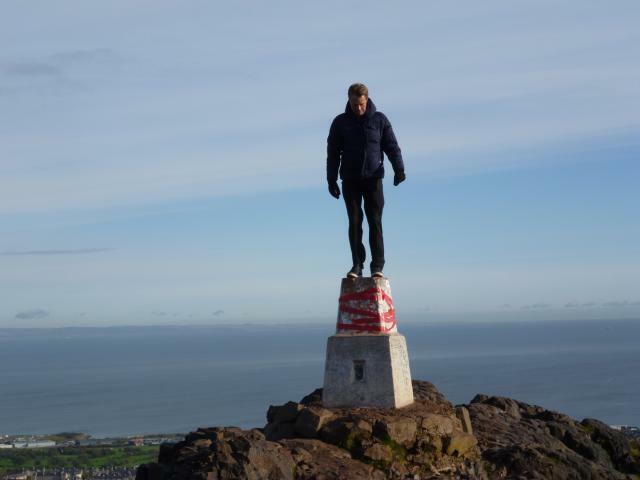 I haven't stood here for 36 years, so by now it's probably 6" shorter - or, if you go for the ice-age land-readjustment theory, 6" taller! 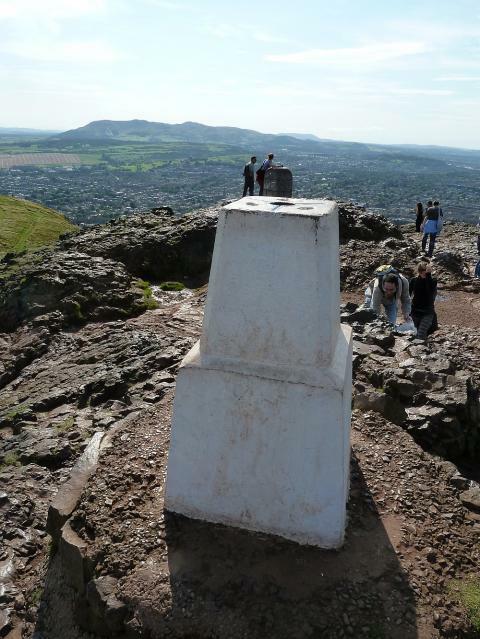 Anyway, on a day like today with clear blue skies there can't be a better view in the whole of the UK. 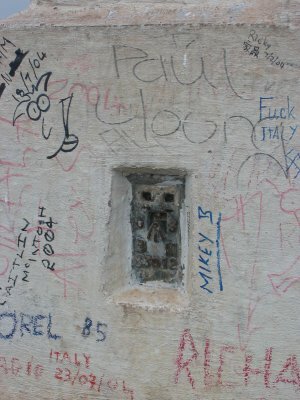 The pillar has a lot of graffiti on it, some of that inspired by the recent Euro 2004; it's very white and a non-standard design, with a short stumpy base. 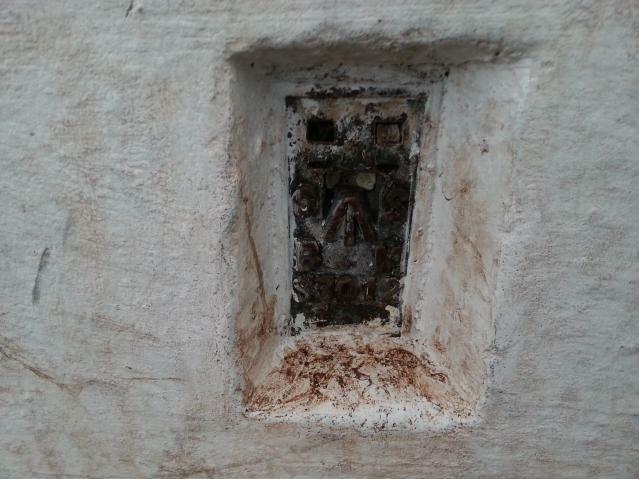 The central plug is missing and there are some chips out of the top corners. 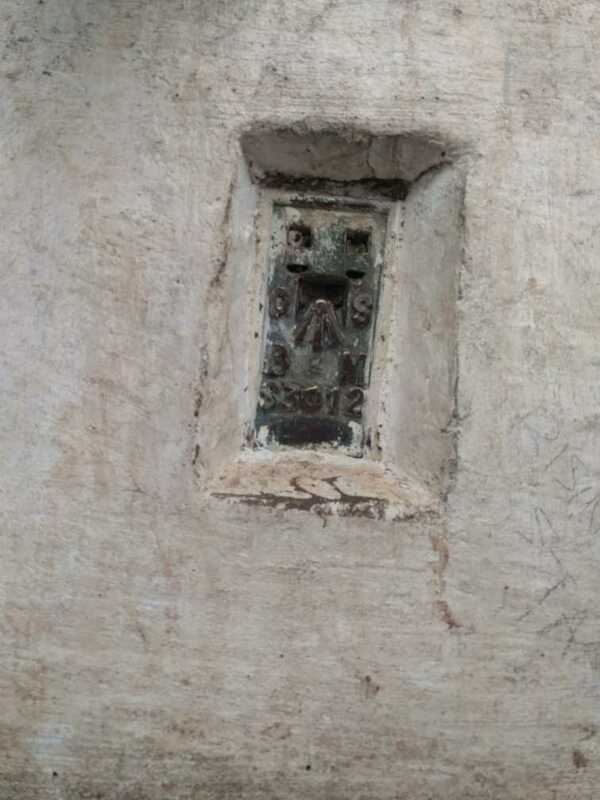 Also, two of the three hooks on the top face are broken. Otherwise, it has survived the numbers of visitors very well. 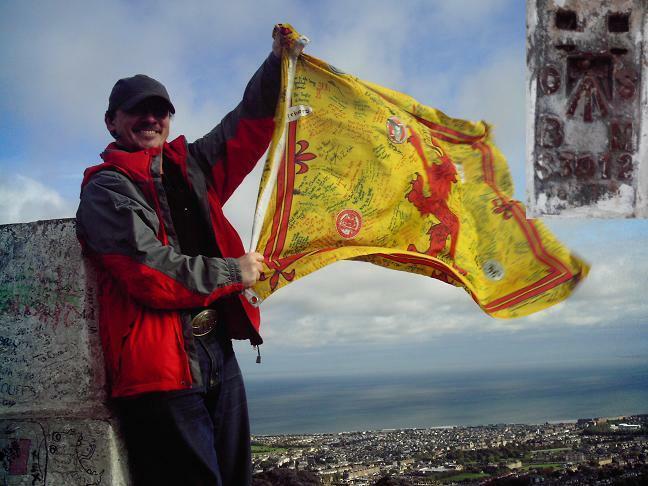 By the way, don't any Scottish people come up here? 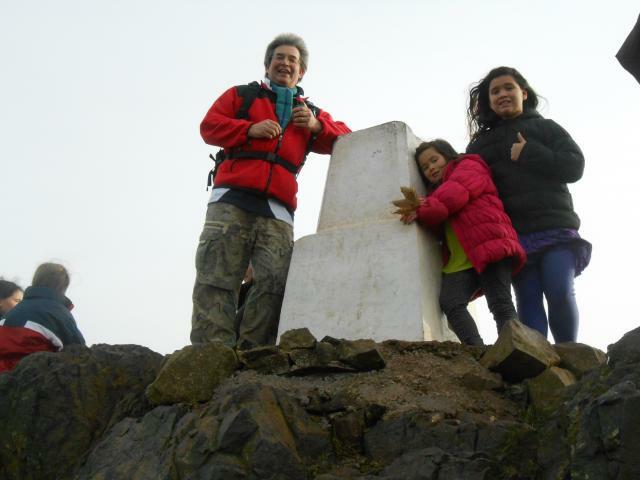 - most of the people wandering about on the summit were from all the four corners of the world! 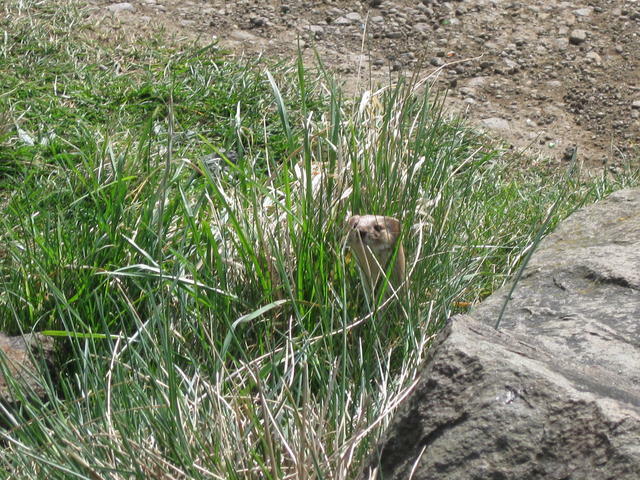 Did stay there long because it was very busy and there was a huge rain cloud heading my way! Years since I'd last been up here. They've built a path to the top you could drive a bus up. 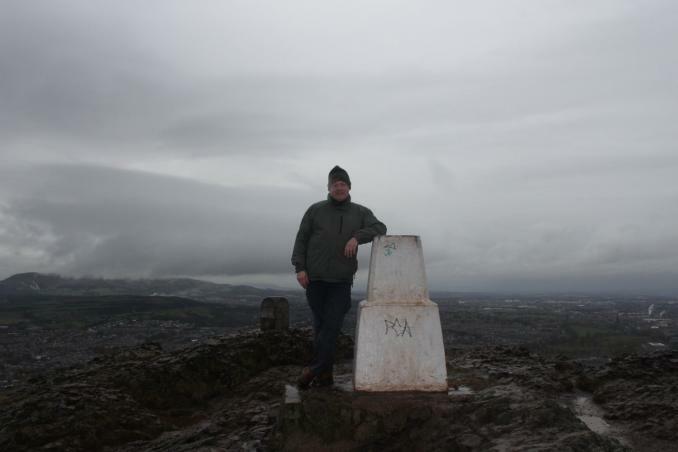 Had the summit to myself, probably due to the drizzle. Eaten alive by the midgies. 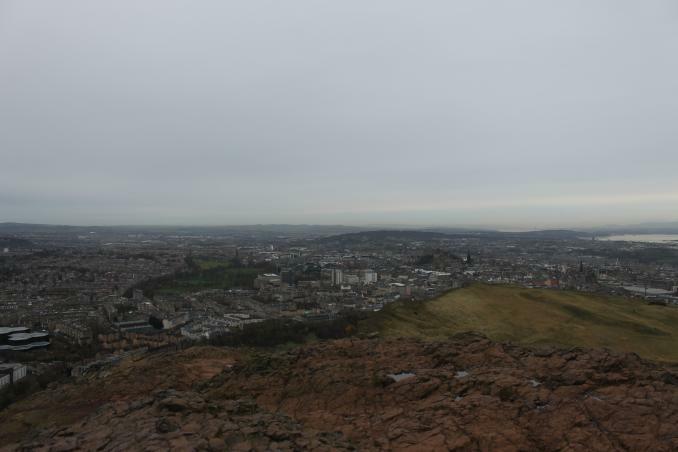 Arthur's Seat - S3012 Dominating the Edinburgh skyline. 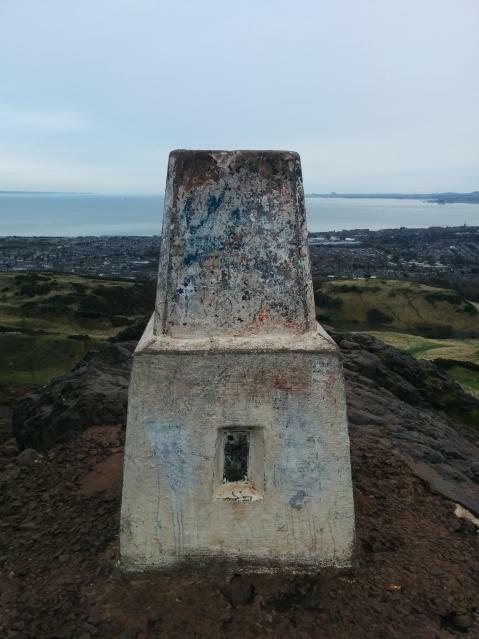 Came up looking for the cache Arthur's Seat 2, but it was missing. Logged the TRIG instead. Excellent views on a bright sunny day. Nipped up after a climb in the south quarry. Busy as usual. 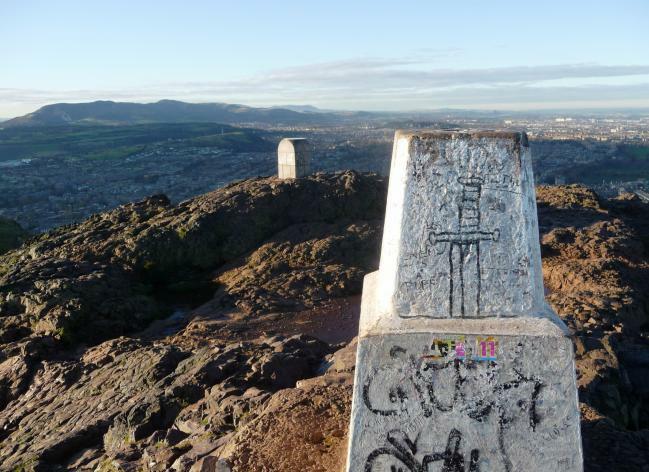 Ace views but graffiti on trig. 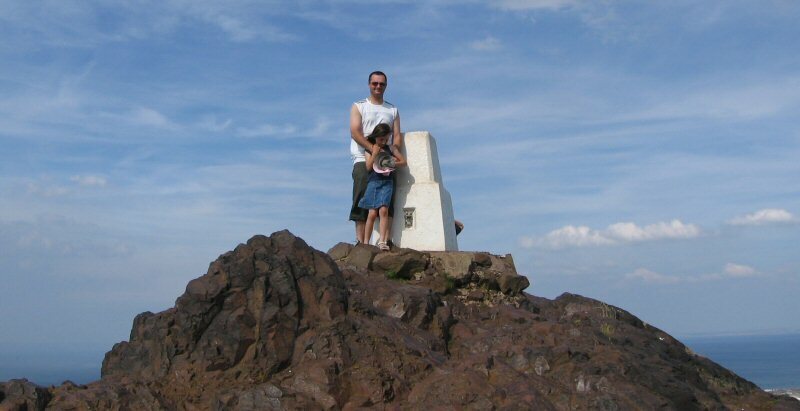 I had to go to the top after doing Path to Arthur's Seat 2 geocache. More people up here than there is on princes street. 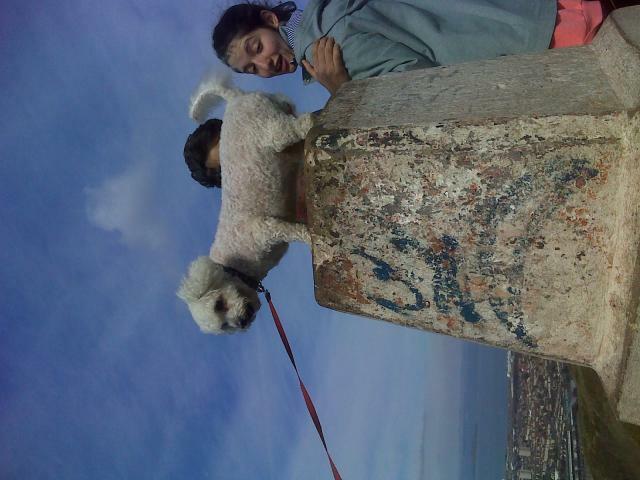 Had to climb to the top after finding the nearby goecache. Already dark at 5:30pm. Still a few people around. 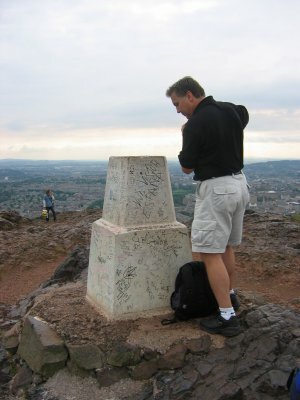 This was not my first time up Arthur's Seat, but this was by far the most memorable of any visit I have made to any trig point. 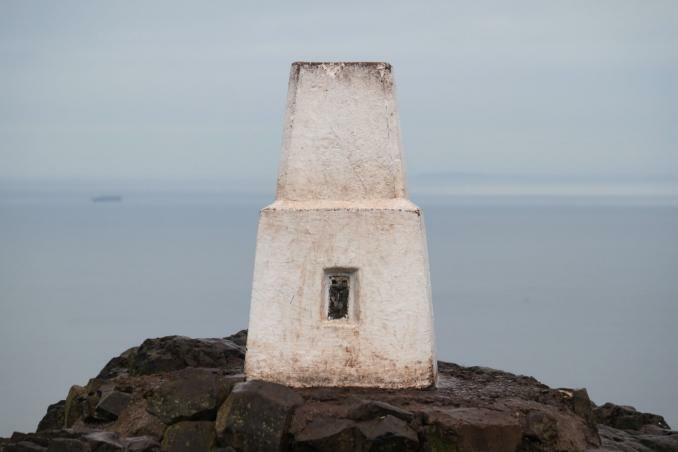 This was the last trig point on my coastal walk around Britain, and as I sat at the trig point in the drizzle I thought about the last 6,265 miles - all the pain, heartache, joy and love I had experienced as I strolled around this great country. I sat down and did not want to leave as I knew that a little over a mile away at the castle there was a reception committee to walcome me to the end of the walk, and I really did not want it to end. I just wanted to keep walking, not to meet them, to see more, to experience more, to walk on and on and on. If you have to end an ultra-long distance walk, try and end it in such a beautiful place. 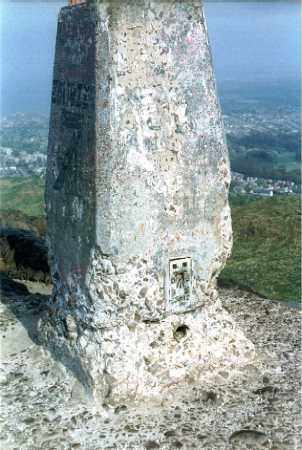 April 2003, this trig pillar was subjected to a horrific vandal attack. FB still intact. Recent Damage. This damage was immediately reported to the OS. 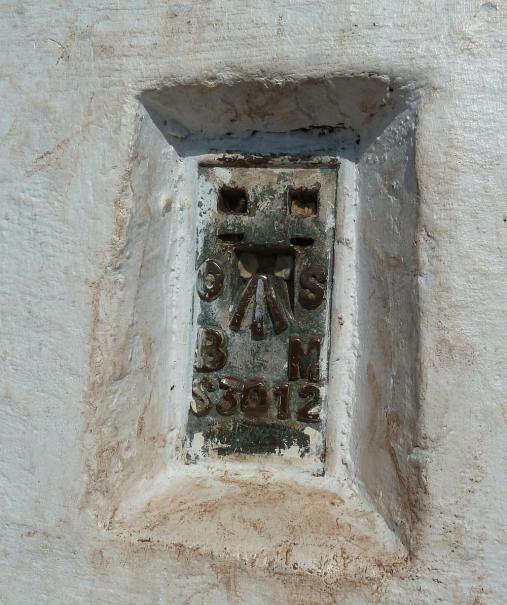 The pillar was repaired and repainted within two months. Closer inspection. We'll never really know what the perpetrator's motive was, but this trig lives on. 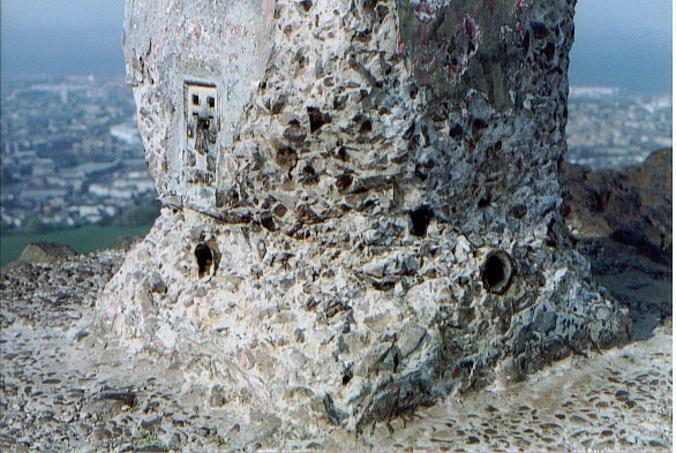 January 2003, slight damage around base where a previous repair is starting to disintegrate. 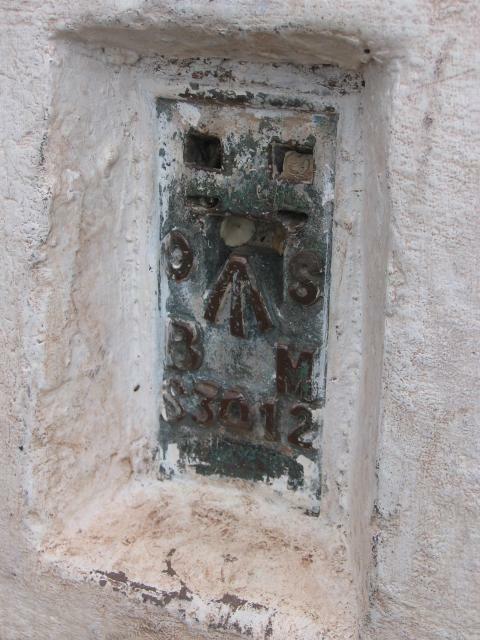 Three months later, vandals took advantage of this weakness and did considerable damage to the pillar. 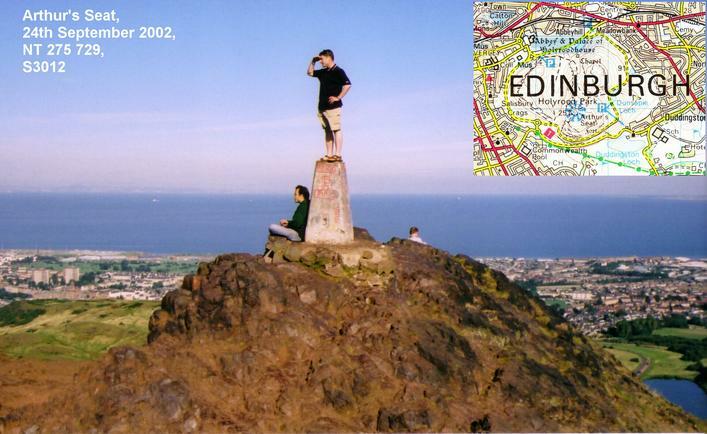 Fantastic views from Arthur's Seat, one of Edinburgh's extinct volcanos. 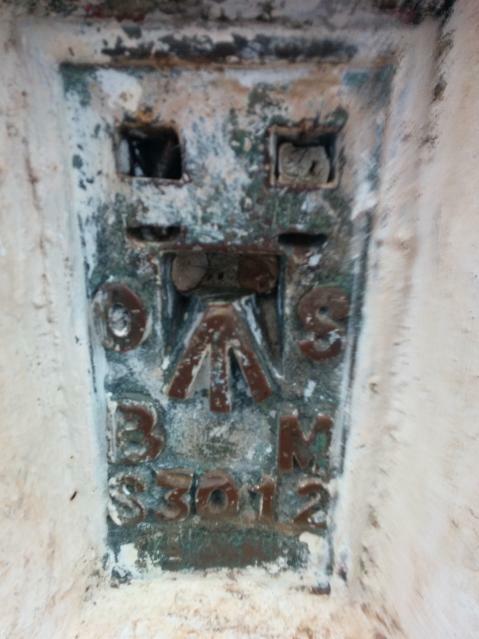 Flush Bracket S3012. Fits in with neighbouring trig FB numbers. Before the damage. See the cracks near the bottom? 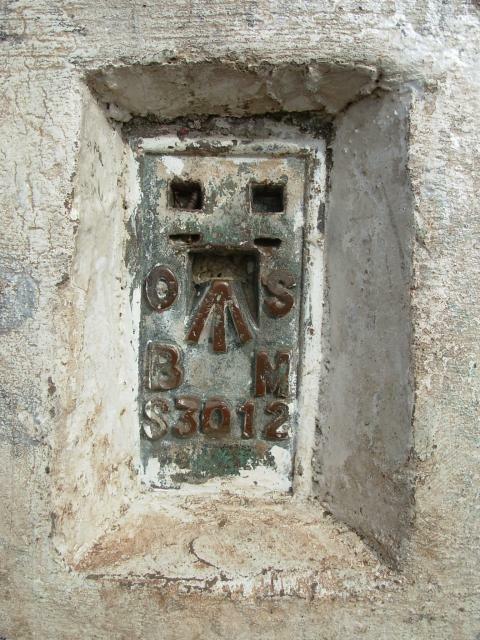 It appears that this is where the vandals were to starting picking away at the concrete. 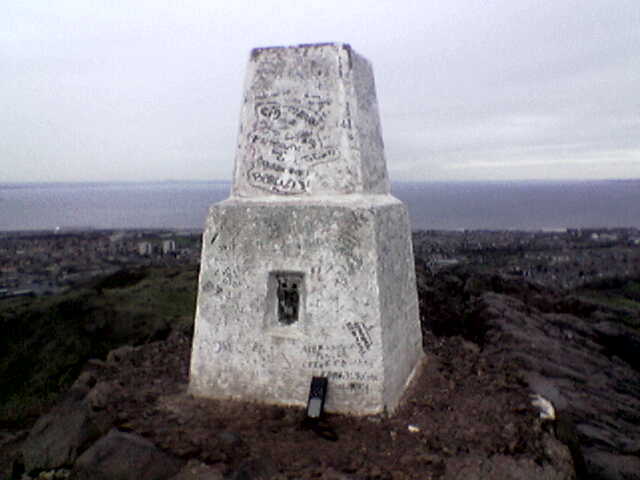 Been to the summit several times and usually make an excuse to walk up here each time I'm in Edinburgh. Been up a few times but this is my first logged visit. Walking off the hangover after the RL Cup Final at Murrayfield. Climbed htis the day after I met the girl who ended up being my girlfriend. 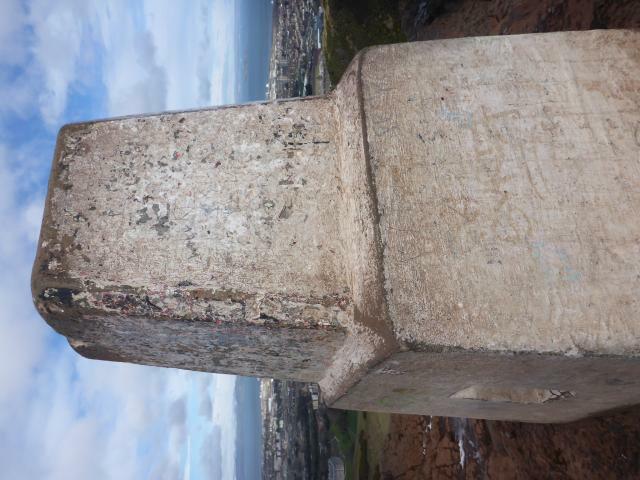 Later on this pillar was to mark another significant moment in my life. A classic. Visited several times over the years. Ascended as part of traditional Edinburgh University freshers week ending at 4am on a Sunday morning. 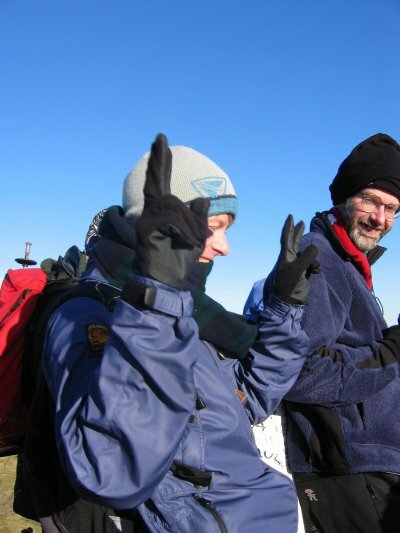 Very cold on summit! 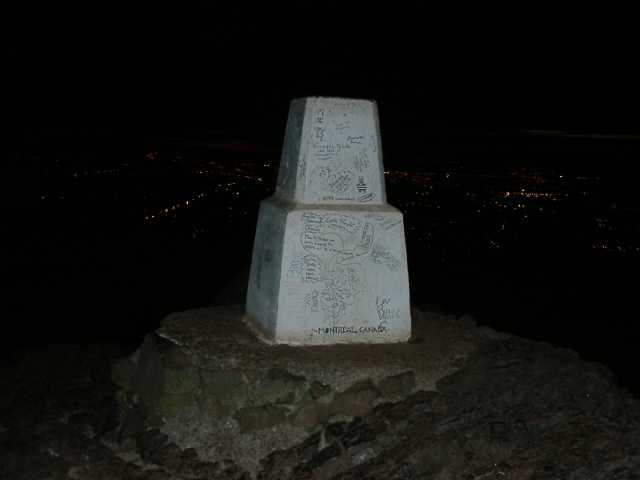 I do not recommend climbing it in the dark when drunk with girls wearing heels and miniskirts. 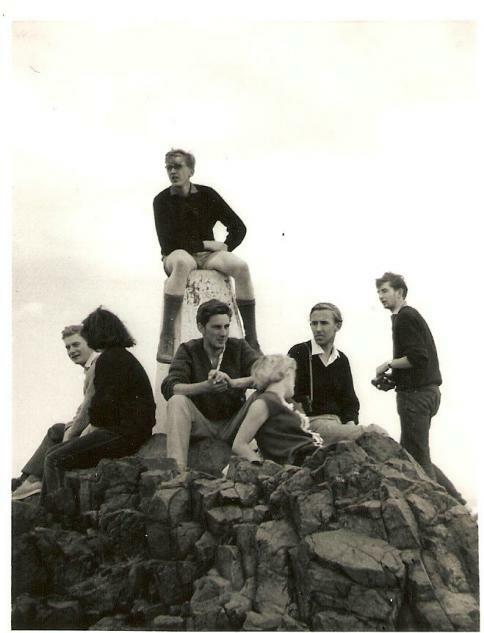 Probably why they don't let the freshers do this anymore in these health and safety obsessed days. Sometimes need to queue just to touch pillar in its magnificent situation. First visit, when we brought Daughter No 2 to register as a student at Edinburgh University. Took the easy option of walking from Dunsapie Loch. 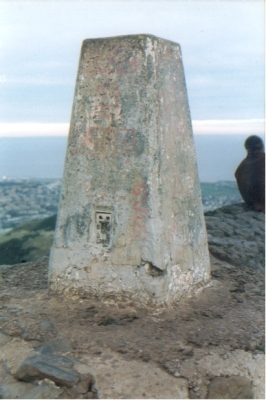 The trigpoint was then in its original state. 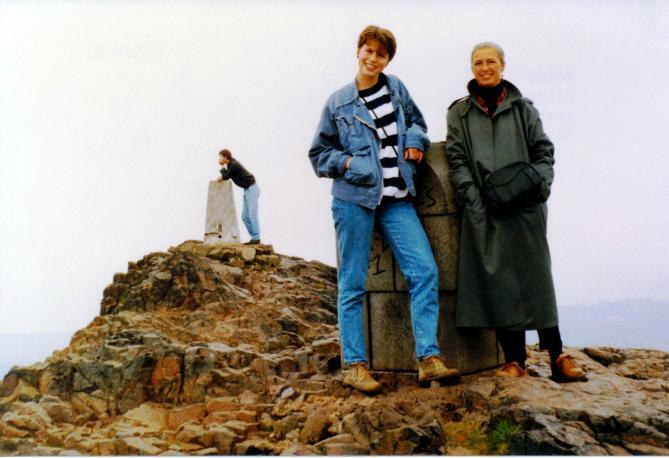 Arthurs Seat Mrs B and Daughter No 2 near the top - the pillar was in its unrestored state at that time. 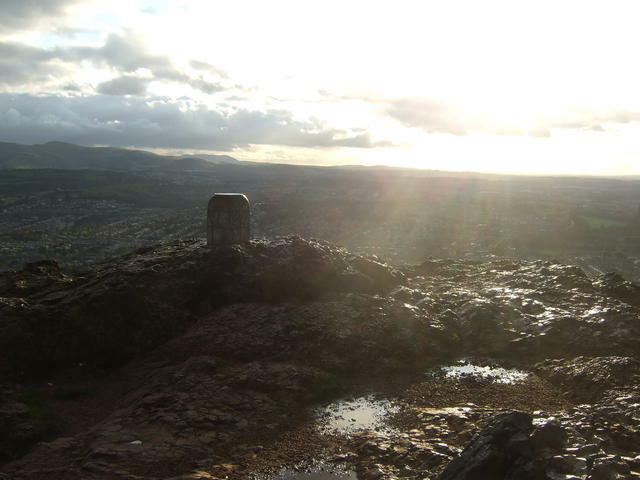 Evening run up during the week of the Commonwealth Games held just below here. First logged the FB in spring 1983. 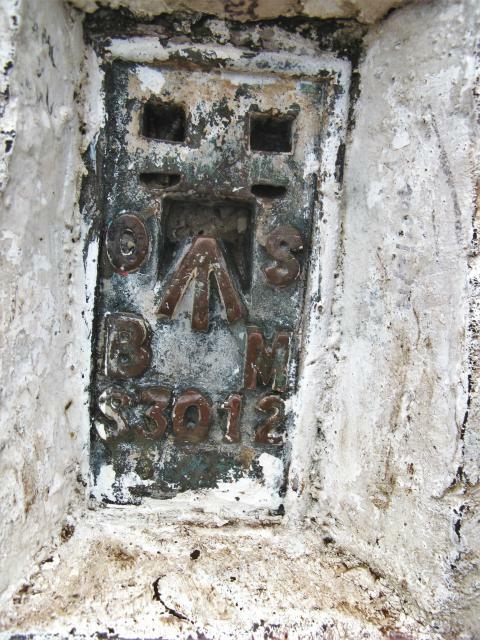 Pillar completed 30th January 1943, costing �9.6s.4d. 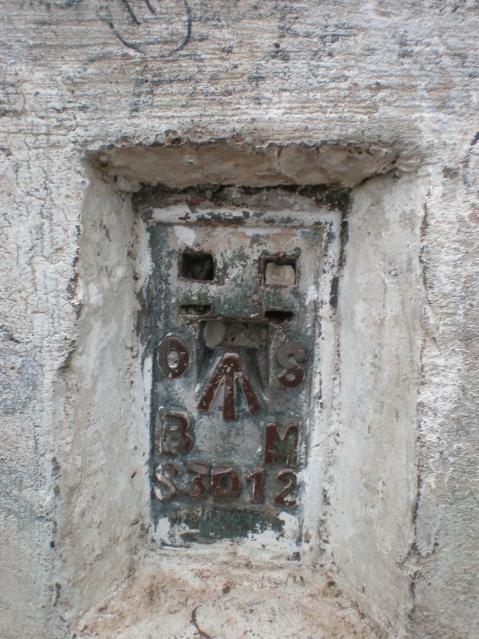 Secondary station S10 in Block NT48, Edinburgh. GRP.